전용 및 공유 채널들이 사용되는 무선 통신 시스템에서 제어된 전송기 전력을 제공하는 시스템, 구성 요소들 및 방법들이 제공된다. To systems, components and methods are provided for providing a transmitter power control in a wireless communication system in which a dedicated and shared channels are used. 네트워크 유닛은 양호하게는 WTRU에 의해 사용가능한 UL SCH와 연관된 UL DCH 상에서 WTRU에 의해 전송된 신호들의 수신에 기초하여 UL DCH들에 대한 목표 매트릭들을 계산하는 처리기와 적어도 하나의 UL SCH와 UL DCH들 상에서 WTRU들로부터 UL 사용자 데이터를 수신하는 수신기를 구비한다. Network unit to preferably a processor and at least one UL SCH and UL DCH based on the reception of signals transmitted by the WTRU on the UL DCH associated with available UL SCH is used by the WTRU for computing target metrics for the UL DCH on and a receiver for receiving UL user data from the WTRU. 각각의 계산된 UL DCH 목표 매트릭으로부터 유도된 각각의 UL SCH 목표 매트릭을 출력하기 위해 구성된 공유 채널 목표 매트릭 발생기가 제공된다. A shared channel target metric generator configured to output a respective UL SCH target metric derived from each computed UL DCH target metric is provided. 각 WTRU는 양호하게는 공유 채널 목표 매트릭 발생기로부터 출력된 각각의 UL SCH 목표 매트릭들의 함수로서 관련 UL SCH에 대한 UL SCH 전력 조정 및 UL DCH의 WTRU에 의해 전송된 신호들의 수신에 기초하여 네트워크 유닛에 의해 계산된 UL DCH 목표 매트릭들의 함수로서 UL SCH와 연관된 UL DCH에 대한 UL DCH 전력 조정을 계산하도록 구성된 처리기를 구비한다. To each of the WTRU based on preferably the reception of signals transmitted by the WTRU in the UL SCH power adjustments and UL DCH for the associated UL SCH as a function of the respective UL SCH target metrics output from the shared channel target metric generator, the network unit as a function of UL DCH target metrics computed by and a processor configured to compute UL DCH power adjustments for an UL DCH associated with the UL SCH. 양호하게는, 그 목표 매트릭들은 목표 SIR들이다. Preferably, the target metrics are the target SIR. 본원 발명은 무선 통신 시스템들에서 전력 제어를 위한 방법 및 장치, 특히 고속 공유 채널들을 사용하는 시스템들에 관한 것이다. The present invention relates to a method and apparatus, in particular, systems using a high speed shared channel for power control in wireless communication systems. 무선 통신 시스템들은 기술 분야에서 널리 공지되어 있다. Wireless communication systems are well known in the art. 무선 시스템들을 위한 글로벌 접속을 제공하기 위해, 표준들이 개발되어 왔고 구현되고 있다. In order to provide global connectivity for wireless systems, standards have been developed and implemented. 널리 사용되는 하나의 현재 표준은 GSM(Global System for Mobile Telecommunications)으로서 알려져 있다. One current standard that is widely used is known as GSM (Global System for Mobile Telecommunications). 이것은 소위 제 2 세대 이동 무선 시스템 표준(2G)으로서 간주되며 그것의 수정 표준(2.5G)이 뒤를 잇고 있다. This is the so-called second-generation mobile radio system is considered as a standard (2G) is followed modify its standards (2.5G) is followed. GPSRS 및 EDGE는 (2G) GSM 네트워크들의 상위에서 상대적으로 고속 데이터 서비스를 제공하는 2.5G 기술들의 일 예이다. GPSRS and EDGE are examples of 2.5G technologies that offer one high-speed data services in a relatively higher of (2G) GSM networks. 이 표준들의 각각은 부가적인 특징 및 개선에 의해 종래 표준을 향상하려고 시도해왔다. Each of these standards has been trying to improve the conventional standard by the additional features and improvements. 1998년 1월에, ETSISMG(European Telecommunication Standard Institute-Special Mobile Group)는 UMTS(Universal Mobile Telecommunications Systems)라 불리는 제3 세대 무선 시스템용 무선 엑세스 방식에 합의하였다. 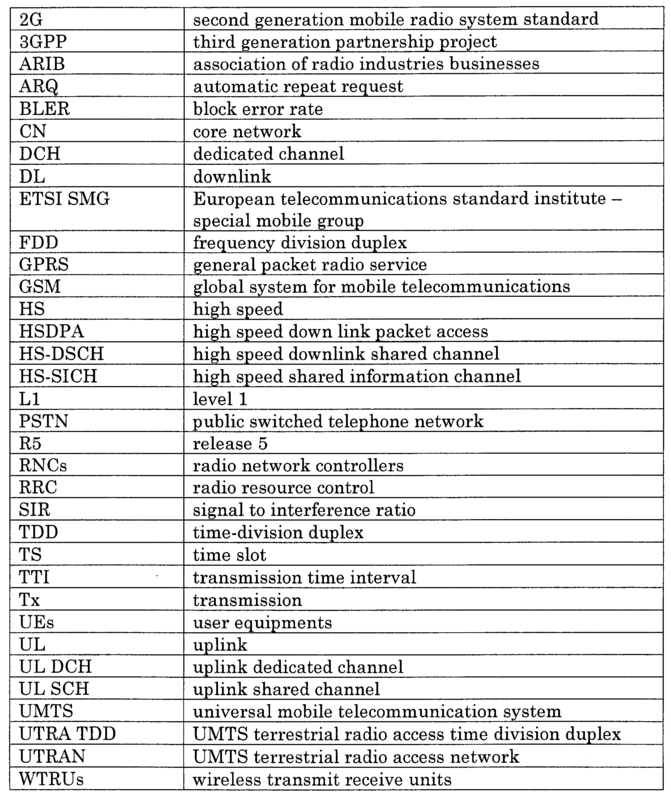 In January 1998, (European Telecommunication Standard Institute-Special Mobile Group) ETSISMG agreed on the radio access scheme for Third Generation Radio Systems called (Universal Mobile Telecommunications Systems) UMTS. UMTS 표준을 추가적으로 구현하기 위해, 3GPP(Third Generation Partnership Project)가 1998년 12월에 형성되었다. To further implement the UMTS standard, (Third Generation Partnership Project) 3GPP was formed in December 1998. 3GPP는 공통 3세대 이동 무선 표준에 계속하여 노력을 기울이고 있다. 3GPP has committed to continue to common third-generation mobile radio standard. 현재의 3GPP 사양에 따른 통상적인 UMTS 시스템 아키텍처가 도 1에 도시되어 있다. The conventional UMTS system architecture in accordance with current 3GPP specifications is depicted in Figure 1; UMTS 네트워크 아키텍처는 현재 공개되어 입수가능한 3GPP 사양에 관한 문서에 상세하게 규정되어 있는 Iu로서 공지되어 있는 인터페이스를 통해 UTRAN(UMTS Terrestrial Radio Access Network)와 상호 접속된 CN(Core Network)을 포함한다. The UMTS network architecture includes a UTRAN (UMTS Terrestrial Radio Access Network) and interconnected (Core Network) CN via an interface known as Iu which is defined in detail in the documentation of the 3GPP specifications can obtain the current disclosure. UTRAN은 Uu로서 공지된 무선 인터페이스를 통해 3GPP에서 UE(User Equipment)들로서 알려진 WTRU(wireless transmit receive units)를 통해 사용자들에게 무선 통신 서비스들을 제공하도록 구성된다. The UTRAN is configured via a radio interface known as Uu through WTRU (wireless transmit receive units) known as UE (User Equipment) in 3GPP, to users so as to provide wireless communication services. UTRAN은 UE들과의 무선 통신을 위한 지리적인 커버리지를 집합적으로 제공하는, 3GPP에서 노드 B들로 알려진 하나 이상의 기지국들 및 RNC(Radio Network Controller)들을 갖는다. UTRAN has a, one or more base stations known in 3GPP as the Node B and RNC (Radio Network Controller) for providing geographic coverage for wireless communications, collectively with the UE. 하나 이상의 노드 B들은 3GPP에서 Iub로 알려진 인터페이스를 통해 각각의 RNC에 접속된다. One or more Node B are connected to each RNC via an interface known as Iub in 3GPP. UTRAN은 상이한 RNC들에 접속된 노드들 B들의 여러 그룹을 구비할 수 있고, 그 중 2개가 도 1에 도시되어 있다. UTRAN may be provided with a number of groups of nodes B connected to a different RNC, there the two are of which is shown in Fig. 2개 이상의 RNC가 UTRAN에 제공되는 경우, RNC 간의 통신은 Iur 인터페이스를 통해 수행된다. If more than one RNC is provided in the UTRAN, the communication between the RNC is performed via an Iur interface. 네트워크 구성 요소들 외부의 통신들은 외부 시스템들에 대한 다양한 CN 접속들을 통해 네트워크 레벨의 CN 및 Uu 인터페이스를 통한 사용자 레벨의 노드 B들에 의해 수행된다. Network configuration, the external communication element are performed by the Node B of the user level by a variety of network level via the Uu interface and the CN CN connected to external systems. 일반적으로, 노드 B들과 같은 기지국들의 주요 기능은 기지국들의 네트워크와 WTRU들 간의 무선 접속을 제공하는 것이다. In general, the main functions of the base station such as node B, is to provide a radio connection between the WTRU and the network of base stations. 통상적으로 기지국은 비접속된 WTRU들이 기지국의 타이밍과 동기되도록 하는 공통 채널 신호들을 방출한다. Typically a base station emits common channel signals allowing non-connected WTRU are in synchronization with the timing of the base station. 3GPP에서, 노드 B는 UE들과의 물리적인 무선 접속을 수행한다. In 3GPP, a Node B performs the physical radio connection with the UE. 노드 B는 Uu 인터페이스를 통해 노드 B에 의해 전송된 무선 신호들을 제공하는 RNC로부터 Iub 인터페이스 상의 신호들을 수신한다. The Node B receives signals over the Iub interface from the RNC providing a radio signal transmitted by the Node B over the Uu interface. CN은 그것의 정확한 목적지에 정보를 라우팅할 책임이 있다. CN is responsible for routing information to its correct destination. 예컨대, CN은 노드 B 중 하나를 통해 UMTS에 의해 수신된 음성 트래픽 또는 인터넷을 향하는 패킷 데이터를 UE로부터 PSTN로 라우팅할 수 있다. For example, CN may route the data packets destined for the Internet traffic or voice received by the UMTS via one of the Node B to the PSTN from the UE. 3GPP에서, CN은 6개의 주요 구성 성분들, 즉 1)서빙 GPRS(General Packet Radio Service) 지원 노드, 2)게이트웨이 GPRS 지원 노드, 3)보더(border) 게이트웨이, 4)방문자 위치 레지스터, 5)모바일 서비스 스위칭 센터, 및 6)게이트웨이 모바일 서비스 스위칭 센터를 구비한다. In 3GPP, CN has six major components, namely: 1) a serving GPRS (General Packet Radio Service) support node, and 2) a gateway GPRS support node, and 3) a border (border) gateway, 4) a visitor location register, and 5) the mobile and a service switching center, and 6) a gateway mobile services switching center. 서빙 GPRS 지원 노드는 인터넷과 같은 패킷 스위칭 영역으로의 엑세스를 제공한다. A serving GPRS support node provides access to packet switched domain, such as the Internet. 게이트웨이 GPRS 지원 노드는 다른 네트워크들에 대한 접속을 위한 게이트웨이 노드이다. The gateway GPRS support node is a gateway node for connections to other networks. 다른 오퍼레이터의 네트워크들 또는 인터넷으로 가는 모든 데이터 트래픽은 게이트웨이 GPRS 지원 노드를 통과한다. All data traffic going to other operator's networks or the internet goes through the gateway GPRS support node. 보더 게이트웨이는 네트워크 영역 내의 가입자들에 대한 네트워크 외부의 침입자들에 의한 공격을 방어하기 위한 방화벽으로서 기능한다. The border gateway acts as a firewall to defend against attacks by intruders outside the network on subscribers within the network realm. 방문자 위치 레지스터는 서비스들을 제공하기 위해 필요한 가입자 데이터의 현재 서빙 네트워크들의 "사본"이다. The visitor location register is required by the current serving network of the subscriber data "Copy" to provide services. 이 정보는 초기에 모바일 가입자들을 관리하는 데이터베이스로부터 발생한다. This information comes from a database that early management of mobile subscribers. 모바일 서비스 스위칭 센터는 UMTS 단말로부터 네트워크로의 "회로 스위칭" 접속을 담당한다. Mobile services switching center is in charge "circuit switched" from UMTS terminals to the network. 게이트웨이 모바일 서비스 스위칭 센터는 가입자들의 현재 위치에 기초하여 요구되는 라우팅 기능들을 구현한다. The gateway mobile services switching center implements routing functions required based on current location of subscribers. 게이트웨이 모바일 서비스들은 또한 외부 네트워크들로부터 가입자들로부터의 접속 요구들을 수신하고 관리한다. The gateway mobile services also receives a connection request from the subscriber management from external networks. RNC들은 일반적으로 UTRAN의 내부 기능을 제어한다. RNC are generally control internal functions of the UTRAN. RNC들은 또한 예컨대 국내 UMTS의 셀룰러 전화로부터의 국제 호출과 같이, CN과 외부 시스템간의 접속을 통해 외부 서비스 구성 요소와 노드 B와의 Uu 인터페이스 접속을 통한 로컬 구성 요소를 갖는 통신을 위한 중계 서비스를 제공한다. RNC can also for example provide, CN and relay services for communications having a local component via a connection between the external system through the external service component and a node B between the Uu interface connection, such as international call from a cellular phone of a domestic UMTS . 통상적으로 RNC는 다수의 기지국들을 감시하고, 노드 B들에 의해 서비스되는 무선 서비스 구역의 지리적 영역 내의 다수의 기지국들을 관리하며, Uu 인터페이스를 위한 물리적 무선 자원들을 제어한다. Typically the RNC monitors a plurality of base stations, and manages a plurality of base stations in the geographic area of ​​a radio service area serviced by the Node B and controls the physical radio resources for the Uu interface. 3GPP에서, RNC의 Iu 인터페이스는 CN에 대한 2개의 접속, 즉 하나는 패킷 스위칭 영역으로의 접속, 다른 하나는 회로 스위칭 영역으로의 접속을 제공한다. In 3GPP, the Iu interface, RNC is connected to two of the CN, i.e., one is connected to a packet switched domain and the other is to provide a connection to a circuit switched domain. RNC들의 다른 중요한 기능들은 기밀성 및 무결성 보호를 포함한다. Another important function of the RNC include confidentiality and integrity protection. 무선 통신 시스템을 위한 다양한 전력 제어 방법들이 기술 분야에 널리 공지되어 있다. Various power control method for wireless communication systems are well known in the art. 무선 통신 시스템을 위한 개루프 및 폐루프 전력 제어 전송 시스템의 예들이 각각 도 2 및 3에 도시되어 있다. An example of open-loop and closed-loop power control transmission systems for wireless communication systems are illustrated in Figures 2 and 3, respectively. 그러한 시스템들의 목적은 패이딩 전파 채널 및 시변(time varying) 간섭이 존재하는 경우에 원격 말단부에서 수신된 데이터가 수용할 만한 품질이 되는 것을 보증하면서 전송 전력을 최소화하기 위해 전송 전력을 신속하게 변화시키는 것이다. The purpose of such systems is to rapidly change the transmission power in order to minimize the transmission power while ensuring that the manhan quality to the data received from the remote end portion received in the case that there is a fading propagation channel and time-varying (time varying) interference will be. 3GPP TDD 및 FDD 시스템들과 같은 통신 시스템에서, 가변적인 속도의 데이터를 갖는 다수의 공유 및 전용 채널들이 전송을 위해 조합된다. In communication systems such as 3GPP TDD and FDD systems, multiple shared and dedicated channels with data of variable rate are combined for transmission. 그러한 시스템들을 위한 배경 사양 데이터는 ARIB(Association of Radio Industrial Business)에 의한 3G 다중 시스템 버전(Multiple System Version) 1.0 및 개정본 1.0의 3GPP TS 25.223v3.3.0, 3GPP TS 25.222 v3.2.0, 3GPP TS 25.224 v3.6 및 Volume 3의 명세서에서 발견된다. Background specification data for such systems are 3G Multiple System Version by (Association of Radio Industrial Business) ARIB (Multiple System Version) 1.0 and revision 1.0 of 3GPP TS 25.223v3.3.0, 3GPP TS 25.222 v3.2.0, 3GPP TS 25.224 v3.6, and it is found in the specification of Volume 3. 보다 최적의 성능을 야기하는 데이터 전송 속도 변화를 위한 전력 제어 적응에 관한 신속한 방법 및 시스템은 본 발명의 출원인에 의해 소유된 2002년 1월 31일에 공개된 국제공개특허 WO 02/09311 A2 및 2001년 7월 12일에 출원된 대응 미국특허출원 09/904,001에 교시되어 있다. More rapid methods for power control adaptation for data rate changes that result in the best performance and system of International Patent Publication WO 02/09311 published on 1 wol 31, 2002, owned by the assignee of the present invention A2 and 2001 the corresponding US patent application filed on July 12, is taught in 09 / 904,001. 공유 채널들의 이용되는 경우, 상이한 WTRU들은 동일한 채널을 사용할 수 있고, 특정 WTRU에 의한 채널 사용은 산발적으로 발생할 수 있다. If the use of the shared channel, are different WTRU may use the same channel and channel use by a particular WTRU can arise sporadically. 본 발명자는 특정한 공유한 채널을 위한 종래의 방법에서는 WTRU들의 상대적인 위치가 그것이 마지막으로 그 특정 공유 채널을 사용했을 때로부터 실질적으로 변화될 수 있기 때문에, 전력 제어를 조정하기 위한 사용된 매트릭(metric)이 용이하게 이용가능하지 않을 수 있다는 점을 인식하였다. The inventors have a metric (metric) used for adjusting the power control, because in the conventional method for a specific shared channel the relative positions of the WTRU may it be the last change to from the time they have used the specific shared channel substantially this was readily recognize that it can not be used. 따라서, WTRU들에 의해 채널들의 산발적인 사용이 발생할 수 있는 경우라도 공유 채널들의 전력을 제어하기 위한 방법 및 장치를 제공하는 것이 바람직하다. Therefore, even when by the WTRU that may result in sporadic use of the channel it is desirable to provide a method and apparatus for controlling the power of the shared channel. 예를 들면, UTRA TDD(UMTS Terrestrial Radio Access Time Division Duplex)의 3GPP 릴리스 5(R5)에서 특정된 물리적 채널들은 HS-DSCH(High Speed Downlink Shared Channel)과 관련하여 동작하는 HS-SICH(High Speed Shared Information Channel)를 포함한다. For example, UTRA TDD (UMTS Terrestrial Radio Access Time Division Duplex) of 3GPP release a physical channel specified in the 5 (R5) are the HS-DSCH (High Speed ​​Downlink Shared Channel) and HS-SICH (High Speed ​​Shared operating in conjunction It includes Information Channel). HS-SICH는 HSDPA(High Speed Downlink Packet Access) 동작을 위한 UTRA TDD R5에 사용되는 고속 업링크(UL) 피드백 채널이다. HS-SICH is a fast Uplink (UL) feedback channel used in UTRA TDD R5 for (High Speed ​​Downlink Packet Access) HSDPA operation. HS-SICH는 HS-DSCH 상의 다운링크(DL) 전송을 수신하는 특정 WTRU로부터 1 비트 Ack/Nack 메시지 및 여러 비트 길이의 측정 보고를 전달한다. HS-SICH transmits the HS-DSCH on the downlink (DL) 1-bit Ack / Nack message and a several bit long measurement report from a particular WTRU that receives the transmission. HS-DSCH는 하이브리드 ARQ(automatic repeat request)를 포함하는 고속 레벨 1(L1) 재전송 기술들 및 상이한 사용자들을 위한 추정된 순간적인 채널 품질에 기초하여 스케줄링을 사용하는 사용자들에 매우 고속의 처리량으로 패킷을 전송하는데 사용되는 HSDPA R5 DL 채널이다. HS-DSCH packets at a very high speed of throughput to users that use scheduling based on the instantaneous channel quality estimates for a high-speed level 1 (L1) retransmission techniques and different users including a hybrid ARQ (automatic repeat request) It is the HSDPA R5 DL channel used for transmitting. 하나의 WTRU만이 HS-DSCH에 대해 10ms으로 현재 특정된 임의의 주어진 TTI(Transmission Time Interval)으로 HS-DSCH을 통해 DL 전송을 수신한다. Only a single WTRU receives a DL transmission through the HS-DSCH as (Transmission Time Interval) given the current TTI to the 10ms for any particular HS-DSCH. 특정 WTRU에 대한 DL HS-DSCH를 포함하는 TTI들과 WTRU의 UL 확인(acknowledgement)을 포함하는 TTI 간에 1:1 상관 관계가 존재하도록, 특정 WTRU는 특정된 TTI 내에서 HS-SICH 상의 DL 전송의 전송 확인의 성공적 또는 비성공적인 수신을 수신한다. 1 between the TTI containing the UL check (acknowledgement) of the TTI and the WTRU including a DL HS-DSCH for a particular WTRU: to the first correlation exists, a particular WTRU is in the DL transmission on the HS-SICH within a specified TTI It receives a successful or unsuccessful receipt of delivery confirmation. 양호하게, 5로 고정되거나 이것 보다 큰, DL 전송 TTI에 후속하는 i번째 TTI로 그 확인이 전송된다. Preferably, it fixed at 5 or its confirmation is transmitted to the large, i-th TTI following the DL transmission TTI than this. 따라서, 소정의 TTI에서, 하나의 WTRU만이 UL HS-SICH로 전송하고, 다른 WTRU들은 각각 다른 TTI들로 패킷 수신을 확인하기 위해 UL HS-SICH를 사용한다. Thus, at a given TTI, only one WTRU transmits to the UL HS-SICH, other WTRU must use the UL HS-SICH in order to check the received packets to different TTI. 다른 UL 채널들을 사용함에 있어서, HS-SICH에 대한 필요한 UL 전송 전력을 결정하기 위해 WTRU에 의한 루프형 전력 제어를 사용하는 것이 바람직하다. In other UL channels to the use, it is preferable to use a loop type power control by a WTRU for determining the necessary UL transmission power for the HS-SICH. 종래에는, WTRU는 도 2에 도시된 바와 같이 개루프 전력 제어 전송기를 구비하도록 구성될 수 있으며, 이 도 2에서는 WTRU는 DL 손실을 측정하고, UTRAN으로부터 WTRU들로 방송되거나 시그널링된 UL 간섭 레벨을 고려한다. Conventionally, the WTRU to the open loop may be configured to include a power control transmitter, and Fig. 2, the WTRU has measured the DL loss, broadcast or signaled from UTRAN to the WTRU UL interference levels, as shown in FIG. consider. 일정한 품질 수신 목표를 충족하기 위해, 소위 외부 루프(outer loop) 전력 제어는 양호하게는 도 2에 도시된 바와 같이 개루프 전력 제어에서 구현되며, 도 2 에서는 Tx 전력 조정은 목표 SIR과 같은 매트릭에 대한 응답하여 행해진다. In order to meet certain quality reception targets, a so-called outer loop (outer loop) power control is preferably is implemented in the open loop power control as shown in FIG. 2, FIG. 2, the Tx power adjustment is a metric, such as target SIR It performed by response. 목표 SIR은 신호의 수신 품질을 제어하기 위해 사용된다. Target SIR is used to control the reception quality of a signal. 보다 높은 목표 SIR은 보다 향상된 복조를 의미하지만, 시스템의 다른 사용자들에 의해 보다 많은 간섭이 발생하게 된다. Higher target SIR implies better demodulation, but more, it becomes, the more interference caused by other users of the system. 보다 낮은 목표 SIR은 시스템의 다른 사용자들에 의한 보다 낮은 간섭을 의미하지만, 복조 품질은 보다 낮다. A lower target SIR implies lower interference from other users in the system, but the demodulation quality is lower than that. 종래에 목표 SIR은 UL 채널의 품질 및 시스템의 간섭의 함수로서 원하는 값을 업데이트하는 외부 루프 전력 제어에 의해 동적으로 제어된다. The conventional target SIR is dynamically controlled by the outer loop power control that updates the desired value as a function of the quality and system of the UL channel interference. WTRU에 대한 외부 루프 기능은 수신된 SIR들 또는 BLER(block-error rates) 관측과 같이 기지국에 의한 수신 UL 전송들의 관찰에 의존한다. The outer loop function relies on observations of received UL transmissions by a base station, as the received SIR or BLER (block-error rates) observed for the WTRU. 예를 들어, 3GPP R5에서 BLER>0.1과 같이 BLER이 허락된 것보다 높게 되고 사용자 데이터가 너무 많은 에러들 때문에 사용할 수 없게 되는 경우, 보다 높은 목표 SIR이 WRTU에 시그널링되며, WTRU는 그 전송 전력을 조정하도록 적용된다. For example, it is higher than that of the BLER as BLER> 0.1 in 3GPP R5 allowed when no user data is to be used because of too many errors, and a higher target SIR signal the WRTU, WTRU has its transmit power It is adapted to adjust. 그러나, 특정 WTRU가 채널에서 산발적으로 전송하는 HS-SICH과 같은 공유 채널들의 시간 공유 특성은 일정한 외부 루프 전력 제어를 확인할 수 있는 주파수로 WTRU 특정 BLER 또는 측정된 SIR이 관찰되는 것을 매우 어렵게 만든다. However, the time of shared channels such as the HS-SICH for a particular WTRU transmitting in the channel sporadically makes it very difficult to share characteristics that WTRU specific BLER or measured SIR observed at a frequency that can identify a certain outer loop power control. 시스템 동작을 보증하면서 보다 간략히하기 위해, 최악의 경우의 목표 SIR로 최악의 경우의 WTRU를 수용하는 HS-SICH 상의 높은 목표 SIR이, 측정값이 특정 WTRU로부터의 수신된 UL 신호들로 구성되는 외부 루프 전력 제어 대신에 선택될 수 있다. Outside that for simplicity than ensuring the behavior of the system, the worst-high target SIR on HS-SICH accommodating the WTRU when the target SIR in the worst case, the measured value is composed of the UL signal received from the particular WTRU It may be selected in place of the power control loop. 그러나, 그 결과로 나타나는 간섭 정도는 다른 채널들이 HS-SICH를 포함하는 TS(Time Slot)로 할당하는 것을 어렵게 한다. However, the degree of interference that appears as a result makes it difficult to assign a TS (Time Slot) for other channels including the HS-SICH. 따라서, 자원들이 소모된다. Thus, the resources are exhausted. 자원 효 율성을 위해 TS를 포함하는 HS-SICH에서 몇 개의 채널들을 동작시키는 것이 바람직하다는 사실은 이러한 문제점을 악화시킨다. For resource efficiency to operate several channels in a TS containing HS-SICH is the fact that it is desirable exacerbates this problem. 외부 루프 전력 제어 없이, HS-SICH 타임슬롯에서의 코드 자원들은 소모된다. Without outer loop power control, code resources are consumed is in the HS-SICH timeslot. 일반적으로, WTRU들이 대형 셀 부분들에서 HS-SICH 상의 신뢰할 만한 UL Tx 전력을 달성할 수 없다면, UTRA TDD의 HSDPA 동작은 힘겹게 타협될 수 있다. In general, if WTRU can achieve a UL Tx power reliable on the HS-SICH in large cell portions, HSDPA operation in UTRA TDD may be compromised painfully. 따라서, HS-SICH 동작에 대해 WTRU 특정 목표 SIR의 정확한 업데이트를 허용하는 UTRA TDD에 대한 메카니즘을 제공하는 것이 바람직하다. Therefore, it is desirable to provide a mechanism for UTRA TDD that allows accurate updates of WTRU specific target SIR for the HS-SICH operation. 본 발명은 전용 채널 및 공유 채널이 사용되는 무선 통신 시스템에서 제어되는 전송기 전력을 제공한다. The present invention provides a transmitter power control in a wireless communication system in which a dedicated channel and a shared channel in use. 일 실시예에서, 외부 루프 전송 전력 제어에는 특정 WTRU에 의한 사용을 위해 할당된 전용 채널들과 WTRU(wireless transmit receive unit)들에 이용가능한 공유 채널들 모두로 사용자 데이터가 시그널링되는 외부 루프 전송 전력 제어를 구비한 무선 통신 시스템이 제공되며, 여기서 WTRU는 UL DCH(uplink dedicated channel) 상에서 데이터 신호들을 전송하고 관련 UL SCH(uplink shared channel) 상에서 데이터 신호들을 산발적으로 전송한다. In one embodiment, the outer loop transmission power control, a dedicated channel, and the WTRU (wireless transmit receive unit) the outer loop transmission power control in which user data is signaled in both a shared channel used for allocation for use by a specific WTRU a there is provided a wireless communication system, in which the WTRU transmits data signals on sporadically transmits data signals on the DCH UL (uplink dedicated channel) and associated UL SCH (uplink shared channel) having a. 네트워크 유닛은 양호하게는 적어도 하나의 UL SCH 및 UL DCH들 상에서 WTRU들로부터 UL 사용자 데이터를 수신하는 수신기와, WTRU에 의해 사용가능한 UL SCH와 연관된 UL DCH 상에서 WTRU에 의해 전송된 신호들의 수신에 기초하여 UL DCH들의 목표 매트릭들을 계산하기 위한 처리기를 구비한다. Network units are preferably based on the reception of signals transmitted by at least one UL SCH and the WTRU on the UL DCH associated with available UL SCH used by the receiver and, WTRU for receiving UL user data from the WTRU on the UL DCH It will be provided with a processor for computing target metrics of the UL DCH. 각각의 계산된 UL DCH 목표 매트릭으로부터 유도된 각각의 UL SCH 목표 매트릭을 출력하도록 구성된 공유 채널 목표 매트릭 발생기가 제공된다. A shared channel target metric generator configured to output a respective UL SCH target metric derived from each computed UL DCH target metric is provided. 각 WTRU는 양호하게는 UL 채널들에 대한 목표 매트릭의 함수로서 전송 전력 조정값을 계산하는 처리기를 구비한다. Each WTRU is preferably provided with a processor for calculating the transmission power adjustments as a function of target metrics for UL channels. 그 WTRU 처리기들은 양호하게는 UL DCH 상에서 WTRU에 의해 전송된 신호들의 수신에 기초하여 네트워크 유닛에 의해 계산된 UL DCH 목표 매트릭의 함수로서 UL SCH와 연관된 UL DCH에 대한 UL DCH 전력 조정값을 계산하도록 구성되고, 또한 그 처리기는 공유된 채널 목표 매트릭 발생기로부터 출력된 각각의 UL SCH 목표 매트릭의 함수로서 관련된 UL SCH에 대한 UL SCH 전력 조정값을 계산하도록 구성된다. The WTRU processors are preferably to compute UL DCH power adjustments for the UL DCH associated with an UL SCH as a function of UL DCH target metrics computed by the network unit based on the reception of signals transmitted by the WTRU on the UL DCH constructed and also the processor is configured to calculate the UL SCH power adjustments for the associated UL SCH as a function of the respective UL SCH target metrics output from the shared channel target metric generator. 또한, 각 WTRU는 WTRU의 처리기와 동작면에서 관련되어 있으며, 각각의 계산된 UL DCH 및 UL SCH 전력 조정에 대응하는 각각의 전력 레벨들로 UL DCH 및 관련 UL SCH 상에서 사용자 데이터를 전송하기 위한 전송기를 구비하고 있다. In addition, each WTRU is related to the handler and the operation side of the WTRU, and a transmitter for transmitting user data on the UL DCH and associated UL SCH as a respective power levels corresponding to respective computed UL DCH and UL SCH power adjustments and a. 양호하게는 목표 매트릭은 목표 SIR(signal to interference ratio)들이고, 이 통신 시스템은 WTRU 전송을 위한 개루프 또는 폐루프 전송 전력 제어를 구비한다. Should preferably target metric is deulyigo target SIR (signal to interference ratio), the communication system comprising an open loop or closed loop transmission power control for WTRU transmissions. 본 발명은 SCH 목표 SIR들이 발생되는 SCH들이 HS-DSCH들(High Speed Downlink Shared Channels)에 연관하여 동작하는 HS-SICH들(High Speed Shared Information Channels)인 3GPP R5 시스템과 같은 UMTS(Universal Mobile Telecommunications System)에서의 구현에 제한되는 것은 아니지만 이에 특히 적합하다. The invention will SCH generated to SCH target SIR HS-DSCH in (High Speed ​​Downlink Shared Channels) operates HS-SICH in (High Speed ​​Shared Information Channels) of UMTS (Universal Mobile Telecommunications System, such as a 3GPP R5 system associated with the ) is being implemented at the limit, but this is particularly suitable. 하나의 대안의 실시예로서, 네트워크 유닛은 양호하게는 공유 채널 목표 매트릭 발생기를 포함한다. As an example of one alternative, the network unit preferably includes a shared channel target metric generator. 그 경우에 있어서, 개루프 시스템에 대해, 그 네트워크 유닛은 양호하게는 DCH 및 SCH 목표 SIR들을 전송하도록 구성된 전송기를 포함하며, WTRU들 각각은 양호하게는 WTRU의 처리기가 수신된 DCH 및 SCH 목표 SIR들에 기초하여 전력 조정값을 계산하도록 각각의 DCH 및 SCH 목표 SIR들을 수신하도록 구성된 수신기를 포함한다. In that case, for an open-loop system, the network unit preferably DCH and SCH target and a transmitter configured to transmit the SIR, WTRU each is preferably the received DCH and SCH target processor of the WTRU SIR s to calculate a power adjustment value based on a receiver configured to receive respective DCH and SCH target SIR. 폐루프 시스템에 있어서는 공유 채널 목표 매트릭 발생기를 포함하고, 그 네트워크 유닛은 양호하게는 공유 채널 목표 매트릭 발생기에 의해 발생된 SCH 목표 SIR들 및 네트워크 유닛의 처리기에 의해 계산된 DCH 목표 SIR의 함수로서 DCH 및 SCH 전력 스텝 명령들을 생성하도록 구성된 구성 요소와, DCH 및 SCH 전력 스텝 명령들을 전송하도록 구성된 전송기를 포함한다. It includes a shared channel target metric generator in the closed-loop system, and the network unit as a function of the DCH target SIR calculated by preferably the SCH target processor of the SIR and the network unit generated by the shared channel target metric generator DCH and a component, and a transmitter configured to transmit DCH and SCH power step commands configured to generate SCH power step commands. WTRU들의 각각은 양호하게는 WTRU의 처리기가 수신된 DCH 및 SCH 전력 스텝 명령들에 기초하여 전력 조정값을 계산하도록 각각의 DCH 및 SCH 전력 스텝 명령을 수신하도록 구성된 수신기를 포함한다. Each of the WTRU preferably includes a receiver configured to receive respective DCH and SCH power step commands to the processor of the WTRU computes power adjustments based on received DCH and SCH power step commands. 다른 대안의 실시예에서, 각 WTRU는 공유 채널 목표 매트릭 발생기를 포함하고, 목표 매트릭은 목표 SIR들이다. In another alternative embodiment, each WTRU includes a shared channel target metric generator, the target metrics are target SIR. 여기서 통신 시스템은 WTRU 전송을 위한 개루프 전송 전력 제어를 구비하고, 그 네트워크 유닛은 DCH 목표 SIR들을 전송하도록 구성된 전송기를 포함하고, WTRU들 각각은 WTRU의 처리기가 수신된 DCH 목표 SIR들에 기초하여 WTRU의 공유 채널 목표 매트릭 발생기에 의해 발생된 SCH 목표 SIR들 및 수신된 DCH 목표 SIR들에 기초하여 전력 조정값을 계산하도록 각각의 DCH 목표 SIR들을 수신하도록 구성된 수신기를 포함한다. Wherein the communication system is based on the provided open loop transmission power control for WTRU transmission, the network unit includes a transmitter configured to transmit DCH target SIR, and each of a WTRU is the processor of the WTRU received DCH target SIR SCH based on the target SIR and the received SIR DCH target generated by the shared channel target metric generator of the WTRU computes power adjustments for a receiver configured to receive respective DCH target SIR. 본 발명은 다른 WTRU들에 대한 전송 전력 제어를 실행하는 서빙 WTRU를 제공하며, 여기서 사용자 데이터는 비특정 WTRU들에 이용가능한 업링크(UL) 공유 채널들과 특정 WTRU에 의한 사용을 위해 할당된 전용 UL 채널들 모두에서 다른 WTRU들에 의해 서빙 WTRU에 시그널링되며, 그 특정 WTRU는 UL DCH 상에서 데이터 신호들을 전송하고 UL SCH상에서 데이터 신호들을 산발적으로 전송하고, 다른 WTRU들은 각각 WTRU에 의해 계산된 UL 목표 매트릭의 함수로서 UL DCH 및 관련 UL SCH에 대한 UL 채널 전력 조정값을 계산하는 처리기를 포함한다. The invention provides a serving WTRU running the transmission power control for other WTRU, wherein the user data is the only allocated for use by a particular WTRU and the available uplink (UL) shared channels available to non-specific WTRU in all of the UL channel by another WTRU is signaled to the serving WTRU, the particular WTRU is the transmitted data signals on the UL DCH and transmitting data signals sporadically on the UL SCH and the other WTRU are computed by each WTRU UL target as a function of the metric and a processor for calculating the UL channel power adjustments for the UL DCH and associated UL SCH. 그 서빙 WTRU는 양호하게는 적어도 하나의 UL SCH와 UL DCH들 상에서 다른 WTRU들로부터의 UL 사용자 데이터를 수신하는 수신기와, WTRU에 의해 사용가능한 UL SCH와 연관된 UL DCH에서 서 WTRU에 의해 전송된 신호들의 수신에 기초하여 UL DCH들에 대한 목표 매트릭을 계산하는 처리기와, 각각의 계산된 UL DCH 목표 매트릭으로부터 유도된 각각의 UL SCH 목표 매트릭을 출력하도록 구성된 공유 채널 목표 매트릭 발생기를 포함한다. The serving WTRU is a signal transmitted by the standing WTRU in preferably at least one UL SCH and UL and a receiver for receiving UL user data from other WTRU on the DCH, UL DCH associated with an UL SCH usable by the WTRU based on the reception of the includes a shared channel target metric generator configured to output a respective UL SCH target metric derived from the processor and, UL DCH target metric computed for each of the target metrics computed for the UL DCH. 양호하게는, 목표 매트릭은 목표 SIR들이다. Preferably, the target metrics are target SIR. 여기서 서빙 WTRU는 UMTS(Universal Mobile Telecommunications System)에서 사용하기 위한 것이며, 이것은 양호하게는 WTRU 전송을 위한 개루프 또는 폐루프 전송 전력 제어를 구비한 UTRAN(UMTS Terrestrial Radio Access Network)으로서 UMTS에 사용하기 위해 구성되며, SCH 목표 SIR들이 발생되는 SCH들은 HS-DSCH들과 연관하여 동작하는 HS-SICH들이다. Wherein the serving WTRU is for use in the (Universal Mobile Telecommunications System) UMTS, this is preferably for use in UMTS as a UTRAN (UMTS Terrestrial Radio Access Network) having a open loop or closed loop transmission power control for WTRU transmission configuration and, SCH that occur SCH target SIR HS-SICH are those that operate in conjunction with the HS-DSCH. 개루프 시스템에 있어서, UTRAN은 양호하게는 DCH 및 HS-SICH 목표 SIR들을 전송하도록 구성되며, 이에 의해 다른 WTRU들은 상기 UTRAN 전송기로부터 수신된 DCH 및 HS-SICH 목표 SIR들에 기초하여 전력 조정값을 계산하는 전송기를 더 포함한다. Dog the in-loop system, UTRAN is preferably DCH and HS-SICH is configured to transmit the target SIR, whereby the other WTRU are power adjustment based on the DCH and HS-SICH target SIR received from the UTRAN transmitter value further it includes a transmitter to calculate. 폐루프 시스템에 있어서, UTRAN은 양호하게는 공유 채널 목표 매트릭 발생기에 의해 발생된 HS-SICH 목표 SIR들 및 처리기에 의해 계산된 DCH 목표 SIR들의 함수로서 DCH 및 HS-SICH 전력 스텝 명령들을 발생하도록 구성된 구성 요소와, DCH 및 HS-SICH 전력 스텝 명령들을 전송하고, 이에 의해 상기 다른 WTRU들이 상기 UTRAN의 전송기로부터 수신된 DCH 및 HS-SICH 전력 스텝 명령들에 기초하여 전력 조정값을 계산하도록 구성된 전송기를 포함한다. In the closed-loop system, configured to the UTRAN as a function of the DCH target SIR calculated by preferably the HS-SICH target SIR and the handler generated by the shared channel target metric generator generates DCH and HS-SICH power step commands configuring the element, DCH and HS-SICH power step sending a command, and configured to compute power adjustments based on the DCH and HS-SICH power step commands the other WTRU that is received from the UTRAN transmitter whereby the transmitter It includes. 본 발명은 또한 무선 통신 시스템에 대한 전송 전력 제어를 구비한 WTRU를 제공하며, 여기서 사용자 데이터는 비특정 WTRU들에 이용가능한 공유 채널들 및 특정 WTRU에 의해 사용하기 위해 할당되는 전용 채널들 모두로 시그널링되며, WTRU는 UL DCH 상의 데이터 신호들을 전송하고, 관련 UL SCH 상에서 데이터 신호들을 산발적으로 전송한다. The invention also provides a WTRU with a transmission power control for a wireless communication system, in which user data is signaled to all of the dedicated channel assigned for use by a shared channel and a particular WTRU is available to non-specific WTRU and, WTRU transmits data signals on the associated UL SCH sporadically transmits data signals on the UL DCH, and. 또한, WTRU는 양호하게는 UL DCH 상에서 WTRU에 의해 전송된 신호들의 수신에 기초하여 계산된 UL DCH에 대한 목표 매트릭을 수신하는 수신기와, 수신된 UL DCH 목표 매트릭으로부터 유도된 UL SCH 목표 매트릭들을 출력하도록 구성된 공유 채널 목표 매트릭 발생기, 및 공유 채널 목표 매트릭 발생기로부터 출력된 UL SCH 목표 매트릭의 함수로서 UL SCH 전력 조정값을 계산하고 수신된 UL DCH 목표 매트릭의 함수로서 UL DCH 전력 조정값을 계산하도록 구성된 목표 매트릭의 함수로서 전력 조정값을 계산하는 처리기를 포함한다. Further, WTRU is preferably outputs the UL SCH target metric derived from a receiver, the received UL DCH target metrics for receiving target metrics for the UL DCH calculated based on the reception of signals transmitted by the WTRU on the UL DCH a shared channel target metric function of a generator, and a shared channel target metric UL SCH as a function of target metrics computed for UL SCH power adjustments and received UL DCH target metrics output from the generator is configured to configured to calculate the UL DCH power adjustments as a function of target metrics and a processor which computes power adjustments. 양호하게는 목표 매트릭은 SIR들이고, 처리기는 수신된 DCH 목표 SIR들에 기초하여 WTRU의 공유 채널 목표 매트릭 발생기에 의해 발생된 SCH 목표 SIR들 및 수신된 DCH 목표 SIR들에 기초하여 전력 조정값을 계산한다. Preferably the target metric is deulyigo SIR, processor computes power adjustments based on the base by the the SCH target SIR generated by the shared channel target metric generator of the WTRU and the receiving on received DCH target SIR DCH target SIR do. 이 처리기는 WTRU에 의한 전송을 위해 UL DCH 전송 데이터 신호들과 계산된 UL DCH 전력 조정값을 조합하도록 구성된 조합기와 WTRU에 의한 전송을 위해 UL SCH 전송 데이터 신호들과 계산된 UL SCH 전력 조정값을 조합하도록 구성된 조합기를 구비한 전송기와 동작면에서 관련되어 있다. The processor is the UL DCH transmission data signals and the computed UL DCH power adjustments for transmission by the configured combiner and the WTRU to combine the value calculated with the UL SCH transmission data signals UL SCH power adjustments for transmission by the WTRU It is involved in the transmitter and the operation side having a combiner configured to combine. WTRU는 유리하게는 WTRU 전송을 위한 개루프 전송 전력 제어를 구비한 UMTS에서 사용하기 위해 구성될 수 있으며, 여기서 SCH 목표 SIR들이 발생되는 SCH들은 HS-SDCH들과 연관하여 동작하는 HS-SICH들이다. The WTRU advantageously may be configured for use in a UMTS having an open loop transmission power control for WTRU transmission, where SCH is to generate SCH target SIR are the HS-SICH to operate in conjunction with the HS-SDCH. 그러한 경우에, 처리기는 양호하게는 수신된 DCH 목표 SIR들에 기초하여 WTRU의 공유 채널 목표 매트릭 발생기에 의해 발생된 HS-SICH 목표 SIR들 및 수신된 DCH 목표 SIR들에 기초하여 전력 조정값을 계산한다. In such a case, the processor preferably computes power adjustments based upon the HS-SICH target SIR and received based on received DCH target SIR generated by the shared channel target metric generator of the WTRU DCH target SIR do. 또한, 그 처리기는 양호하게는 WTRU에 의한 전송을 위해 UL DCH 전송 데이터 신호들과 계산된 UL DCH 전력 조정값을 조합하도록 구성된 조합기와 WTRU에 의한 전송을 위해 UL HS-SICH 전송 데이터 신호들과 계산된 UL HS-SICH 전력 조정값을 조합하도록 구성된 조합기를 구비한 전송기와 동작면에서 연관되어 있다. In addition, the processor is preferably a UL HS-SICH transmission data signals and calculated for transmission by the configured combiner and the WTRU to combine the UL DCH power adjustments calculated with the UL DCH transmission data signals for transmission by the WTRU the one may be associated with the operation at the transmitter side includes a combiner configured to combine the UL HS-SICH power adjustments. 무선 통신 시스템을 위한 외부 루프 전송 전력 제어 방법이 제공되며, 여기서 사용자 데이터는 비특정 WTRU들에 이용가능한 공유 채널들 및 특정 WTRU에 의한 사용을 위해 할당된 전용 채널들 모두에서 시그널링되고, 그 WTRU는 UL DCH 상에서 데이터 신호들을 전송하고 연관된 UL SCH 상에서 데이터 신호들을 산발적으로 전송한다. There is provided an outer loop transmission power control method for a wireless communication system, in which user data is signaled in both a dedicated channel assigned for use by a shared channel and a particular WTRU is available to non-specific WTRU, the WTRU is transmitting data signals on the UL DCH and transmits the data signal on the associated UL SCH sporadically. 일 방법에서, UL 사용자 데이터는 적어도 하나의 UL SCH와 UL DCH들 상에서 WTRU들로부터 수신되고, 목표 매트릭이 네트워크 유닛에 의해 상기 WTRU에 의해 사용가능한 UL SCH와 연관된 UL DCH 상에서 WTRU에 의해 전송된 신호들의 수신에 기초하여 UL DCH들에 대해 계산된다. In one method, UL user data is at least one is received from the WTRU on the UL SCH and the UL DCH, the target metric is transmitted by the WTRU on the UL DCH associated with an UL SCH usable by the WTRU by a network unit signal to be calculated for the UL DCH based on the reception of. 각각의 UL SCH 목표 매트릭은 각각의 계산된 UL DCH 목표 매트릭으로부터 유도된다. Respective UL SCH target metric is derived from each computed UL DCH target metric. UL SCH와 연관된 UL DCH에 대한 UL DCH 전력 조정은 UL DCH 상에서 WTRU에 의해 전송된 신호들의 수신에 기초하여 네트워크 유닛에 의해 계산된 UL DCH 목표 매트릭의 함수로서 각 WTRU에 의해 계산된다. UL DCH power adjustments for the UL DCH associated with an UL SCH are computed by each WTRU as a function of UL DCH target metrics computed by the network unit based on the reception of signals transmitted by the WTRU on the UL DCH. 연관된 UL SCH에 대한 UL SCH 전력 조정은 공유 채널 목표 매트릭 발생기로부터 출력된 각각의 UL SCH 목표 매트릭의 함수로서 계산된다. UL SCH power adjustments for the associated UL SCH are computed as a function of the respective UL SCH target metrics output from the shared channel target metric generator. UL DCH 및 관련 UL SCH 상의 사용자 데이터는 계산된 각각의 UL DCH 및 UL SCH 전력 조정값에 대응하는 각각의 전력 레벨들로 각 WTRU에 의해 전송된다. User data on the UL DCH and associated UL SCH is transmitted by each WTRU to the respective power levels corresponding to the respective UL DCH and UL SCH power adjustments calculated. 각각의 UL SCH 목표 매트릭들은 네트워크 유닛 또는 WTRU들 중 어느 하나에 의해 각각의 계산된 UL DCH 목표 매트릭으로부터 유도될 수 있다. Respective UL SCH target metrics can be derived from each computed UL DCH target metric by either the network unit or a WTRU. 양호하게는, 목표 매트릭은 목표 SIR들이다. Preferably, the target metrics are target SIR. 또한, 외부 루프 전력 제어 방법들은 WTRU 전송을 위한 개루프 또는 폐루프 전송 전력 제어에 대해 구현될 수 있다. In addition, the outer loop power control methods can be implemented for open-loop or closed-loop transmission power control for WTRU transmissions. 그 방법들은 유리하게는 네트워크 유닛이 UTRAN이고 SCH 목표 SIR들이 생성되는 SCH들이 HS-SDCH들과 연관하여 동작하는 HS-SICH들인 UTMS에서 구현될 수 있다. The method may be implemented in a network, which are advantageously the unit UTRAN and SCH target SIR HS-SICH to generate SCH are to operate in conjunction with the HS-SDCH is UTMS. 본 발명은 서빙 WTRU에 의해 다른 WTRU들에 대한 전송 전력 제어를 실행하는 방법을 포함하며, 여기서 사용자 데이터는 비특정 WTRU들에 이용가능한 업링크(UL) 공유 채널들 및 특정 WTRU에 의한 사용을 위해 할당된 전용 UL 채널들 모두에서 상기 다른 WTRU들에 의해 상기 서빙 WTRU으로 시그널링되고, 그 특정 WTRU는 UL DCH 상에서 데이터 신호들을 전송하고 연관된 UL SCH 상에서 데이터 신호들을 산발적으로 전송하며, 다른 WTRU들은 각각 상기 서빙 WTRU에 의해 계산된 UL 목표 매트릭의 함수로서 UL DCH 및 연관된 UL SCH에 대한 UL 채널 전력 조정값을 계산한다. The invention includes a method for executing a transmission power control for other WTRU by the serving WTRU, wherein the user data is the available uplink (UL) shared channels available to non-specific WTRU, and for use by a specific WTRU in all of the allocated dedicated UL channels by said other WTRU is signaled to the serving WTRU, the and the specific WTRU transmits data signals on the UL SCH associated and transmits data signals on the UL DCH sporadically, other WTRU are, respectively, the as a function of UL target metrics computed by the serving WTRU UL DCH and an associated UL calculates the channel power adjustments for the UL SCH. UL 사용자 데이터는 UL DCH들 및 적어도 하나의 UL SCH 상에서 다른 WTRU들로부터 수신된다. UL user data is received from another WTRU on the UL DCH and at least one UL SCH. UL DCH들에 대한 목표 매트릭은 WTRU에 의해 사용가능한 UL SCH와 연관된 UL DCH 상에서 WTRU에 의해 전송된 신호들의 수신에 기초하여 계산된다. Target metrics for the UL DCH is calculated based on the reception of signals transmitted by the WTRU on the UL DCH associated with an UL SCH usable by the WTRU. 각각의 UL SCH 목표 매트릭들은 각각의 계산된 UL DCH 목표 매트릭으로부터 유도되어 발생된다. Respective UL SCH target metric is generated are derived from each computed UL DCH target metric. 양호하게, 목표 매트릭의 계산 및 발생 단계는 목표 SIR들의 계산 및 발생을 포함한다. Preferably, the calculation step and generation of target metrics comprises computing and generating of target SIR. 그 방법은 유리하게는 UMTS에서 실행되며, 서빙 WTRU는 WTRU 전송들에 대한 개루프 또는 폐루프 전송 전력 제어를 실행하는 UTRAN으로서 구성되며 SCH 목표 SIR들이 발생되는 SCH들은 HS-DSCH들과 연관하여 동작하는 HS-SICH들이다. The method runs on to the UMTS glass, the serving WTRU is configured as a UTRAN to run open-loop or closed-loop transmission power control for WTRU transmission SCH that occur SCH target SIR will operate in conjunction with the HS-DSCH They are the HS-SICH to. 개루프 시스템에서, 양호하게는 DCH 및 HS-SICH 목표 SIR들이 전송되고 이에 의해 다른 WTRU들이 UTRAN으로부터 수신된 DCH 및 HS-SICH 목표 SIR들에 기초하여 전력 조정값을 계산한다. One in a loop system, preferably computes power adjustments based on DCH and the HS-SICH target SIR received DCH and HS-SICH target SIR are transmitted thereto by another WTRU that from the UTRAN. 폐루프 시스템에서, DCH 및 HS-SICH 전력 스텝 명령들이 양호하게는 DCH 목표 SIR들 및 HS-SICH 목표 SIR들의 함수로서 생성되고, DCH 및 HS-SICH 전력 스텝 명령들이 전송되어 다른 WTRU들은 UTRAN으로부터 수신된 DCH 및 HS-SICH 전력 스텝 명령들에 기초하여 전력 조정값을 계산한다. In a closed-loop system, DCH and HS-SICH power step commands are preferably being generated as a function of the DCH target SIR and HS-SICH target SIR, DCH and HS-SICH power step commands are transmitted other WTRU are received from the UTRAN the DCH, and based on the HS-SICH power step commands and calculates a power adjustment value. 또한 무선 통신 시스템에서 사용되는 WTRU에 대한 전송 전력 제어의 방법이 제공되며, 여기서 사용자 데이터가 비특정 WTRU들에 이용가능한 공유 채널들 및 특정 WTRU에 의한 사용을 위해 할당된 전용 채널들 모두에서 시그널링되고, WTRU는 UL DCH 상에서 데이터 신호들을 전송하고, 연관된 UL SCH 상에서 데이터 신호들을 산발적으로 전송한다. In addition, there is provided a method of transmission power control for WTRU used in the wireless communication system in which user data is of a shared channel used for the non-specific WTRU and is signaled in both a dedicated channel assigned for use by a specific WTRU , WTRU transmits data signals on the UL SCH associated sporadically transmits data signals on the UL DCH, and. UL DCH 상에서 상기 WTRU에 의해 전송된 신호들의 수신에 기초하여 계산되는 UL DCH에 대한 목표 매트릭이 수신된다. The target metrics for the UL DCH that is calculated based on the reception of signals transmitted by the WTRU on the UL DCH are received. 수신된 UL DCH 목표 매트릭으로부터 유도된 UL SCH 목표 매트릭이 발생된다. The induced UL SCH target metric from received UL DCH target metric is generated. 수신된 UL DCH 목표 매트릭의 함수로서 UL DCH 전력 조정값이 계산되고 UL SCH 목표 매트릭의 함수로서 UL SCH 전력 조정값이 계산된다. The UL DCH power adjustments as a function of the received UL DCH target metric is computed UL SCH power adjustments are computed as a function of UL SCH target metrics. 양호하게는, 목표 매트릭은 SIR들이고, WTRU는 수신된 DCH 목표 SIR들에 기초하여 상기 WTRU에 의해 발생된 SCH 목표 SIR들 및 수신된 DCH 목표 SIR들에 기초하여 전력 조정값을 계산하고, WTRU는 계산된 UL DCH 전력 조정과 WTRU에 의한 전송을 위한 UL DCH 전송 데이터 신호들을 조합하고, 계산된 UL SCH 전력 조정과 WTRU에 의한 전송을 위한 UL SCH 전송 데이터 신호들을 조합한다. Preferably, the target metrics are SIR deulyigo, WTRU is a based on the received DCH target SIR generated by the WTRU SCH target SIR and, based on received DCH target SIR calculating a power adjustment value, WTRU is combining the UL DCH transmission data signals for transmission by the computed UL DCH power adjustments with the WTRU, and combining the UL SCH transmission data signals for transmission by the computed UL SCH power adjustments with the WTRU. 본 방법은 유리하게는 WTRU 전송을 위한 개루프 전송 전력 제어를 실행하는 UMTS에서 사용하기 위해 구현될 수 있다. The method advantageously can be implemented for use in a UMTS running open loop transmission power control for WTRU transmissions. 그러한 경우에, SCH 목표 SIR들이 발생되는 SIR들은 HS-DSCH들과 연관하여 동작하는 HS-SICH들이고, 여기서 WTRU는 수신된 DCH 목표 SIR들에 기초하여 상기 WTRU에 의해 발생된 HS-SICH 목표 SIR들 및 수신된 DCH 목표 SIR들에 기초하여 전력 조정값을 계산하고, 그 계산된 UL DCH 전력 조정값을 WTRU에 의한 전송을 위한 UL DCH 전송 데이터 신호들과 조합시키고, 계산된 UL HS-SICH 전력 조정값을 WTRU에 의한 전송을 위한 UL HS-SICH 전송 데이터 신호들과 조합시킨다. In such a case, SCH target SIR is SIR occur are deulyigo HS-SICH to operate in conjunction with the HS-DSCH, where the WTRU is in a based on the received DCH target SIR generated by the WTRU HS-SICH target SIR and based on the received DCH target SIR calculating a power adjustment value, the computed UL DCH power adjustments were combined with the UL DCH transmission data signals for transmission by the WTRU, the computed UL HS-SICH power adjustments then combined with the UL HS-SICH transmission data signals for transmission by a value in the WTRU. 다른 목적들 및 장점들은 본 발명의 양호한 실시예에 대한 다음 설명에 기초하여 당업자에게 명백히 이해될 수 있을 것이다. Other objects and advantages will be clearly understood by those skilled in the art on the basis of the following description of the preferred embodiments of the present invention. 도 1은 종래의 UMTS 네트워크의 시스템 아키텍처를 도시하는 도면. 1 is a diagram showing a system architecture of a conventional UMTS network. 도 2는 목표 SIR 매트릭을 통해 외부 루프 전력 제어를 구현하는 무선 통신 시스템에 대한 종래의 개루프 전력 제어 시스템을 도시하는 도면. Figure 2 is a diagram showing a conventional open loop power control system for a wireless communication system which implements outer loop power control via a target SIR metric. 도 3은 목표 SIR 매트릭을 통해 외부 루프 저력 제어를 구현하는 무선 통신 시스템에 대한 종래의 폐루프 전력 제어 시스템을 도시하는 도면. Figure 3 is a view showing a conventional closed loop power control system for a wireless communication system which implements outer loop strength controlled by the target SIR metric. 도 4는 본원 발명의 가르침에 따른 고속 공유 채널 및 전용 채널 모두를 이 용하는 무선 통신용 개루프 전력 제어 시스템을 도시하는 도면. Figure 4 is a view showing the radio communication system to the open loop power control for both the high speed shared channel and a dedicated channel in accordance with the teachings of the present invention. 도 5는 본원 발명의 가르침에 따른 고속 공유 채널 및 전용 채널 모두를 이용하는 무선 통신용 전력 제어 시스템의 대안의 실시예를 도시하는 도면. 5 is a diagram showing an alternate embodiment of the wireless communication power control system using both the high-speed shared channel and a dedicated channel in accordance with the teachings of the present invention. 도 6은 본원 발명의 가르침에 따른 고속 공유 채널 및 전용 채널 모두를 이용하는 무선 통신용 폐루프 전력 제어 시스템을 도시하는 도면. 6 is a view showing a radio communication system using a closed loop power control both the high speed shared channel and a dedicated channel in accordance with the teachings of the present invention. 3GPP와 같은 무선 시스템을 위한 종래의 전력 제어 방법들은 소위 내부 및 외부 루프들을 이용한다. Conventional power control methods for wireless systems such as 3GPP utilize so-called inner and outer loops. 그 전력 제어 시스템은 내부 루프가 개방되어 있는지 또는 폐쇄되어 있는지에 따라 개방 또는 폐쇄로 불린다. The power control system is referred to as open or closed, depending on whether the inner loop is open or that the closure. "전송" 통신국(10)과 "수신" 통신국(30)을 구비한 개루프(open loop) 전력 제어 시스템의 관련 부분들이 도 2에 도시되어 있다. "Transfer" communication station 10 and to the relevant part of the "receiving" communication station 30, one loop (open loop) power control system with a is shown in FIG. 양쪽의 통신국(10,30)은 트랜 시버들이다. In both the communication stations (10,30) are transceiver. 통상적으로 하나는 3GPP에서 노드 B라고 불리는 기지국이고, 다른 하나는 3GPP에서 사용자 장치 UE라고 불리는 일종의 WTRU이다. Typically one is a base station, called a Node B in 3GPP, and the other is a type of WTRU, called a user equipment UE in 3GPP. 명료히하기 위해, 선택된 구성 요소들만이 설명되고 본 발명은 양호한 3GPP 시스템의 관점에서 기술되었지만, 본 발명은 무선 통신 시스템들, 일반적으로는 WTRU들이 무선 통신 시스템들 사이를 통신하는 ad hoc 네트워킹을 수행하는 시스템들에 대해서도 응용될 수 있다. For purposes of clarity, the invention selected components only is being described the present has been described in terms of a preferred 3GPP system, the present invention perform ad hoc networking, the wireless communication system, in general, the WTRU to communicate through the wireless communication system even for systems that can be applied. 전력 제어는 과도한 간섭을 발생시키지 않고 다수 사용자들에 대한 시그널링 품질을 유지하는 것이 중요하다. Power control is important to maintain quality signaling for multiple users without causing excessive interference. 전송국(10)은 전송을 위한 사용자 데이터 신호를 전송하는 데이터 라인(12)을 갖는 전송기(11)를 포함한다. Transmitting station 10 includes a transmitter 11 having a data line 12 for transmitting a user data signal for transmission. 사용자 데이터 신호에는 전송 전력 레벨을 조정하기 위해 처리기(15)의 출력(13)으로부터 전송 전력 조정을 적용함으로써 조정되는 원하는 전력 레벨이 제공된다. User data signal is provided with a desired power level which is adjusted by applying a transmit power adjustment from an output 13 of a processor 15 to adjust the transmission power level. 사용자 데이터는 전송기(11)의 안테나 시스템(14)으로부터 전송된다. The user data is transmitted from the antenna system 14 of the transmitter 11. 그 전송된 데이터를 포함하는 무선 라디오 신호(20)는 수신 안테나 시스템(31)을 통해 수신국(30)에 의해 수신된다. That containing the transferred data wireless radio signal 20 is received by the receiving station 30 via a receiving antenna system 31. 그 수신 안테나 시스템은 또한 수신된 데이터의 품질에 영향을 미치는 간섭 무선 신호들(21)을 수신한다. The receiving antenna system will also receive interfering radio signals 21 that affect the quality of the received data. 수신국(30)은 수신된 신호가 또한 입력되는 간섭 전력 측정 장치(32)를 포함하며, 이 장치(32)는 측정된 간섭 전력 데이터를 출력한다. The receiving station 30 comprises a received signal is also input to the interference power measuring device 32, the device 32 outputs measured interference power data. 수신국(30)은 또한 수신된 신호가 입력되는 데이터 품질 측정 장치(34)를 포함하며, 이 장치(34)는 데이터 품질 신호를 생성한다. The receiving station 30 also includes a received signal input to which a data quality measuring device 34, the device 34 produces a data quality signal. 데이터 품질 측정 장치(34)는 신호 품질 데이터를 수신하고 입력(37)을 통해 수신된 사용자가 정의한 품질 표준 파라미터에 기초하여 목표 SIR 데이터를 계산하 는 처리 장치(36)에 결합된다. Data quality measuring device 34 is coupled to the processing device 36 calculates the target SIR data based on the quality standard parameter is a user received signal quality data, received via the input 37 define. 수신국(30)은 또한 간섭 전력 측정 장치(32) 및 목표 SIR 발생 처리기(36)와 결합된 전송기(38)를 포함한다. The receiving station 30 also includes a transmitter 38 coupled with the interference power measuring device 32 and the target SIR generating processor 36. 수신국의 전송기(38)는 또한 사용자 데이터, 기준 신호, 및 기준 신호 전송 전력 데이터를 각각을 위한 입력들(40,41,42)을 포함한다. The transmitter 38 of the receiving station is also the input for each of the user data, a reference signal, and reference signal transmit power data including (40,41,42). 수신국(30)은 관련된 안테나 시스템(39)을 통해 그것의 사용자 데이터, 제어 관련 데이터 및 기준 신호를 전송한다. The receiving station 30 through an associated antenna system 39 transmits its user data and the control related data and the reference signal. 전송국(10)은 수신기(16) 및 관련 수신 안테나 시스템(17)을 포함한다. Transmitting station 10 includes a receiver 16 and an associated receiving antenna system 17. 전송국의 수신기(16)는 수신국(30)에 의해 발생된 수신국의 사용자 데이터(44) 및 제어 신호 및 데이터(45)를 포함하는 수신국(30)으로부터 전송된 무선 신호를 수신한다. The receiver 16 of the transmitting station receives the radio signal transmitted from the receiving station (30) including user data (44) and a control signal and data 45 of the receiving station caused by the receiving station 30. 전송국의 전송기의 처리기(15)는 전송 전력 조정값을 계산하기 위해 전송국의 수신기(16)와 연관되어 있다. Processor 15 of the transmitting station of the transmitter is associated with the receiver 16 of the transmitting station in order to compute a transmit power adjustment value. 전송기(11)는 또한 수신된 기준 신호 전력을 측정하기 위한 장치(18)를 포함하고, 그 장치(18)는 경로 손실 계산 회로(19)와 연관되어 있다. The transmitter 11 also includes a device 18 for measuring received reference signal power, the device 18 is associated with path loss calculation circuit 19. 전송 전력 조정값을 계산하기 위해, 처리기(15)는 수신국의 목표 SIR 발생 처리기(36)에 의해 발생된 목표 SIR 데이터를 전달하는 목표 SIR 데이터 입력(22)과, 수신국의 간섭 전력 측정 장치(32)에 의해 발생된 간섭 데이터를 전달하는 간섭 전력 데이터 입력(23), 경로 손실 계산 회로(19)의 출력인 경로 손실 신호를 전달하는 경로 손실 데이터 입력(24)으로부터의 데이터를 수신한다. To compute a transmit power adjustment value, the processor 15 is the target SIR data input 22, interference power measuring device for the receiving station to pass the target SIR data generated by the target SIR generating processor 36 of the receiving station It receives data from the interference power data to pass interference data input 23, a path loss calculation circuit 19, a path loss data input 24 which outputs a transmission path loss signals generated by the (32). 경로 손실 신호는 전송기(11)의 기준 신호 전력 측정 장치(18)의 출력을 전달하는 측정된 기준 신호 전력 입력(26) 및 수신국(30)으로부터 발생하는 기준 신호 전송 전력 데이터를 전달하는 기준 신호 전송 전력 데이터 입력(25)을 통해 수신된 데이터로부터 경로 손실 계산 회로(19)에 의해 발생된다. The path loss signal is a reference signal for transmitting a reference signal transmit power data generated from the reference signal power input 26 and the receiving station (30) measured to pass the output of the reference signal power measuring device 18 of the transmitter 11 from data received via the transmission power data input 25 is generated by the path loss calculation circuit 19. 기준 신호 측정 장치(18)는 수신국의 전송기(38)로부터 수신된 기준 신호의 전력을 측정하기 위해 전송국의 수신기(16)와 결합된다. Reference signal measuring device 18 is coupled to the receiver 16 of the transmitting station to measure a reference signal received from the transmitter 38 of the receiving station power. 경로 손실 계산 회로(19)는 양호하게는 입력(26)에 의해 전달된 측정된 수신 전력 세기와 입력(25)에 의해 전달된 알려진 기준 전력 신호 세기 간의 차이에 기초하여 경로 손실을 판단한다. Path loss calculation circuit 19 is preferably on the basis of the difference between the known reference power signal strength conveyed by the measured reception power intensity to the input (25) carried by the input 26 and determines a path loss. 간섭 전력 데이터, 기준 신호 전력 데이터 및 목표 SIR 값들은 전파 채널 및 간섭의 시변 속도 보다 현저히 낮은 속도로 전송국(10)으로 시그널링된다. Interference power data, reference signal power data and target SIR values ​​are signaled to the transmitting station 10 at a substantially lower rate than the time-varying rate of the propagation channel and interference. "내부" 루프는 측정된 인터페이스에 의존하는 시스템의 부분이다. "Inner" loop is the portion of the system which relies on the measured interface. 시스템은 최소 요구 전송 전력의 추정값이 얼마나 양호한가를 나타내는 전파 채널 및 간섭의 시변 속도에 양립하는 속도로 알고리즘으로 피드백하는 것이 존재하지 않기 때문에 "개루프(open loop)"로 간주된다. The system is considered "open loop (open loop)," because there is a feedback to the algorithm at a rate that both the time-varying rate of the propagation channel and interference indicating how good condition is an estimated value of transmission power required minimum. 요구되는 전송 전력 레벨이 빠르게 변화하면, 시스템은 전력 조정 변화에 적절하게 대응할 수 없다. If the transmit power level required changes quickly, the system can not adequately respond to the power control change. 도 2의 개루프 전력 제어 시스템의 외부 루프와 관련하여, 원격 수신국(30)에서, 수신 데이터의 품질은 측정 장치(34)를 통해 평가된다. Also with respect to the outer loop of the open loop power control system of Figure 2, the remote receiving station 30, the quality of the received data is evaluated via the measuring device 34. 디지털 데이터 품질을 위한 통상적인 매트릭(metric)은 비트 에러 레이트 및 블록 에러 레이트이다. Conventional metrics for digital data quality (metric) is the bit error rate and block error rate. 이러한 매트릭의 계산은 시변 전파 채널 및 간섭의 기간보다 현저하게 긴 시간의 기간들에 걸쳐 축적된 데이터를 요구한다. Calculation of these metrics requires data accumulated over periods of time significantly longer than the period of the time-varying propagation channel and interference. 임의의 주어진 매트릭에 대하여, 매트릭과 수신된 SIR 간에는 이론적인 관계가 존재한다. For any given metric, there exists a theoretical relationship between the metric and received SIR. 충분한 데이터가 그 매트릭을 평가하기 위해 원격 수신기에서 축적된 경우, 그것은 계산되어 처리기(36)에서 원하 는 매트릭(원하는 서비스 품질을 나타냄)과 비교되며, 업데이트된 목표 SIR이 출력된다. When enough data has been accumulated in the remote receiver to evaluate the metric, it is computed from the desired processor 36 is compared to the metric (representing a desired quality of service), the updated target SIR is output. 업데이트된 목표 SIR은 전송기 내부 루프에 인가되는 (이론상의) 값이며, 측정된 매트릭이 원하는 값으로 수렴하도록 한다. And that the updated target SIR is applied in the transmitter inner loop (theoretical) value, to cause the measured metric to converge to the desired value. 마지막으로, 업데이트된 목표 SIR은 수신국 전송기(38) 및 전송국 수신기(16)를 통해 그 내부 루프의 사용을 위해 전송기(11)로 전달된다. Finally, the updated target SIR is transmitted to the transmitter 11 for use in its inner loop via the receiving station transmitter 38 and the transmitting station receiver 16. 목표 SIR의 업데이트 속도는 전력 제어된 전송기에 대한 시그널링 속도에 대한 품질 통계 제한 및 실제적인 제한을 축적하기 위해 필요한 시간에 의해 제한된다. Update rate of target SIR is limited by the time required to accumulate the quality statistic and practical limits on the signaling rate to the power limit control of the transmitter. 도 3을 참조하면, 폐루프 전력 제어 시스템을 사용하는 전송국(50) 및 수신국(70)을 구비한 통신 시스템이 도시되어 있다. Referring to Figure 3, there is a communication system having a transmitting station 50 and receiving station 70 using the closed loop power control system is illustrated. 전송국(50)은 전송을 위한 사용자 데이터 신호를 전송하는 데이터 라인(52)을 구비한 전송기(51)를 포함한다. Transmitting station 50 includes a transmitter 51 having a data line 52 for transmitting a user data signal for transmission. 사용자 데이터 신호에는 전력 레벨을 조정하기 위해 처리기(55)의 출력(53)으로부터 전송 전력 조정을 적용함으로써 조정되는 원하는 전력 레벨이 제공된다. User data signal is provided with a desired power level which is adjusted by applying a transmit power adjustment from an output 53 of a processor 55 to adjust the power level. 사용자 데이터는 전송기(51)의 안테나 시스템(54)을 통해 전송된다. The user data is transmitted via an antenna system 54 of the transmitter 51. 전송된 데이터를 포함하는 무선 라디오 신호(60)는 수신 안테나 시스템(71)을 통해 수신국(70)에 의해 수신된다. Wireless radio signal including the transmission data 60 is received by the receiving station 70 via a receiving antenna system 71. 수신 안테나 시스템은 또한 수신 데이터의 품질에 영향을 미치는 간섭 무선 신호들(61)을 수신한다. Receiving antenna system will also receive interfering radio signals 61 that affect the quality of the received data. 수신국(70)은 수신된 신호가 입력되는 간섭 전력 측정 장치(72)를 포함하며, 그 장치(72)는 측정된 SIR 데이터를 출력한다. The receiving station 70 includes a signal input which is received interference power measuring device 72, the device 72 outputs measured SIR data. 수신국(70)은 또한 수신된 신호가 또한 입력되는 데이터 품질 측정 장치(73)를 포함하며, 그 장치(73)는 데이터 품질 신호를 생성한다. The receiving station 70 also has a received signal and also includes a data quality measuring device 73 is inputted, the device 73 produces a data quality signal. 데이터 품 질 측정 장치(73)는 처리기(74)와 연결되며, 이 처리기(74)는 그 신호 품질 데이터를 수신하고, 입력(75)을 통해 수신된 사용자 정의 품질 표준 파라미터에 기초하여 목표 SIR 데이터를 계산한다. Data quality measuring device 73 is connected to the processor 74, receiving the processor 74 is the signal quality data and the target based on the user defined quality standard parameter received through an input (75) SIR data the calculated. 조합기(76)(양호하게는 감산기)는 장치(72)로부터의 측정된 SIR 데이터를 처리기(74)로부터의 계산된 목표 SIR 데이터와 비교하여(양호하게는 감산하여), SIR 에러 신호를 출력한다. Combiner 76 (preferably a subtracter) outputs as compared with the computed target SIR data (preferably subtracted by), SIR error signal from the SIR data processor 74 measured from the device 72 . 조합기(76)로부터의 SIR 에러 신호는 이에 기초하여 스텝 업/다운 명령들을 발생하는 처리 회로(77)에 입력된다. SIR error signal from the combiner 76 based thereon is input to processing circuitry 77 which generates step up / down commands. 수신국(70)은 또한 처리 회로(77)와 결합되는 전송기(78)를 포함한다. The receiving station 70 also includes a transmitter 78 coupled to the processing circuit 77. 수신국의 전송기(78)는 또한 사용자 데이터를 위한 입력(80)을 포함한다. The transmitter 78 of the receiving station also includes an input 80 for user data. 수신국(70)은 연관 안테나 시스템(79)을 통해 그 사용자 데이터 및 제어 관련 데이터를 전송한다. Receiving station 70 via the associated antenna system 79 and transmits the user data and the control related data. 전송국(50)은 수신기(56) 및 관련 수신 안테나 시스템(57)을 포함한다. Transmitting station 50 includes a receiver 56 and an associated receiving antenna system 57. 전송국의 수신기(56)는 수신국에 의해 발생된 제어 데이터(85) 및 수신국의 사용자 데이터(84)를 포함하는 수신국(70)으로부터 전송된 무선 신호를 수신한다. The receiver of the transmitting station 56 receives the radio signal transmitted from the control data 85 and the receiving station (70) including user data (84) generated by the receiving station to the receiving station. 전송국의 전송기의 처리기(55)는 전송국의 수신기(16)와 연관된 입력(58)을 구비한다. Processor 55 of the transmitting station of the transmitter is provided with an input 58 associated with the receiver 16 of the transmitting station. 처리기(55)는 입력(58)을 통해 업/다운 명령 신호를 수신하고, 이에 기초하여 전송 명령 조정값을 계산한다. Processor 55 receives the up / down command signal through input 58, and based thereon calculate the transmission command adjustment value. 폐루프 전력 제어 시스템의 내부 루프와 관련하여, 전송국의 전송기(51)는 원격 수신국(70)에 의해 발생된 고속 "스텝-업" 및 "스텝-다운" 명령들에 기초하여 그 전력을 설정한다. With respect to the inner loop of the closed loop power control system, the transmitter 51 of the transmitting station is a high-speed "step-up" generated by the remote receiving station 70, and the "step-down" on the basis of the command set its power do. 원격 수신국(70)에서, 수신 데이터의 SIR은 측정 장치(72)에 의해 측정되며, 조합기(76)를 통해 처리기(74)에 의해 발생된 목표 SIR 값과 비교된다. The remote receiving station (70), SIR of the received data is measured by the measuring device 72 and compared with a target SIR value generated by the processor 74 via combiner 76. 목표 SIR은 원하는 서비스 품질을 가져오는 값(이론상)-데이터가 그 값으로 수신되는 경우-이다. Value of the target SIR is to obtain a desired quality of service (in theory) is - if the data is received with that value. 측정된 수신 SIR이 목표 SIR보다 작은 경우, "스텝-다운" 명령이 처리 회로(77)에 의해 수신국의 전송기(78) 및 전송국의 수신기(56)를 통해 전송기(51)로 발송되거나, 그렇지 않으며 "스텝-업" 명령이 발송된다. If the measured received SIR is less than the target SIR, "step-down" command, or sent to the transmitter 51 via the transmitter 78 and the receiver 56 of the transmitting station in the reception station by the processing circuit 77, or no "step-up" command is sent. 전력 제어 시스템은 "폐루프"로서 간주되며, 이것은 시변 전파 채널 및 간섭에 실시간으로 반응할 수 있는 "스텝-업" 및 "스텝-다운" 명령들의 고속 피드백에 기인한 것이다. The power control system is considered as a "closed loop", which is capable of reacting in real time to the time-varying propagation channel and interference "step-up" to a "step-down" due to the fast feedback of instructions and. 시변 간섭 및 전파에 기인하여 요구되는 전송 전력 레벨이 변화한다면, 그것은 신속하게 대응하여 전송 전력을 조정한다. If the transmit power level required due to time varying interference and propagation changes, it quickly adjust the transmit power corresponding to the. 폐루프 전력 제어 시스템의 외부 루프에 대하여, 수신 데이터의 품질은 측정 장치(73)에 의해 수신국(70)에서 평가된다. With respect to the outer loop of the closed loop power control system, the quality of the received data is evaluated in the receiving station 70 by the measuring device (73). 디지털 데이터 품질의 전형적인 매트릭은 비트 에러 레이트 및 블록 에러 레이트이다. Typical metrics for digital data quality are bit error rate and block error rate. 이들 매트릭스의 계산은 시변 전파 채널 및 간섭의 기간 보다 현저하게 긴 시간의 기간들에 걸쳐 축적된 데이터를 필요로 한다. Computation of these matrices requires data accumulated over periods of time significantly longer than the period of the time-varying propagation channel and interference. 임의의 주어진 매트릭에 대해서, 매트릭과 수신된 SIR 간에는 이론적인 관계가 존재한다. For any given metric, there exists a theoretical relationship between the metric and received SIR. 그 매트릭을 평가하기 위해 원격 수신기에 충분한 데이터가 축적된 경우, 그것이 계산되어, 처리기(74)에 의해 원하는 매트릭(원하는 서비스 품질을 나타냄)과 비교된 다음, 업데이트된 목교 SIR이 출력된다. When sufficient data to the remote receiver to evaluate the metric is accumulated, it is calculated, the following, the updated mokgyo SIR compared to the metric (representing a desired quality of service) desired by the processor 74 is output. 업데이트된 목표 SIR은 측정된 매트릭이 원하는 값으로 수렴하도록 하는 수신기 알고리즘에 적용된 값(이론상)이다. The updated target SIR is a value (in theory) which applied in the receiver algorithm cause the measured metric to converge to the desired value. 업데이트된 목표 SIR은 전송기(51)의 전력을 제어하기 위해 전송국의 전력 스케일 발생 처리기(55)에 전송되는 스텝 업/다운 명령들의 방향을 결정하기 위해 내부 루프에 사용된다. The updated target SIR is used in the inner loop to determine the direction of the step-up / down commands sent to the power scale generating processor 55 of the transmitting station to control the power of the transmitter (51). 개방 또는 폐쇄 전력 제어 시스템에서, 전송국(10,50)의 외부 루프 기능은 관찰되는 BLER(block-error rates) 또는 수신된 SIR들과 같은 수신국(30,70)에 의한 수신된 전송들의 관찰에 의존한다. In an open or closed power control systems, outer-loop functionality for the transmitting station (10,50) is on observations of received transmissions by the receiving station (30,70), such as the BLER (block error-rates) are observed or received SIR It depends. 예를 들어, 3GPP R5에서 BLER이 허용된 것보다 높고(가령, BLER>0.1), 사용자 데이터가 너무 많은 에러들 때문에 사용할 수 없게 되면, 보다 높은 목표 SIR이 계산되며, 이는 전송국(10,50)이 그 전송 전력을 조정하도록 한다. For example, the BLER is higher than that allowed in the 3GPP R5 (e.g., BLER> 0.1), when no user data is to be used because of too many errors, a higher target SIR is calculated, which is the transmitting station (10,50) and to adjust its transmit power. 그러나, 특정 WTRU가 채널에서 산발적으로만 전송하는 3GPP R5에서 HS-SICH와 같은 공유 채널들의 시간 공유 특성은 일정한 외부 루프 전력 제어를 보증하는 주파수로 WTRU 특정 BLER 또는 측정된 SIR를 관찰하는 것을 매우 어렵게 한다. However, the time of shared channels such as the HS-SICH in 3GPP R5 where a particular WTRU only transmits in the channel sporadically shared characteristics are very difficult to observe WTRU specific BLER or measured SIR with a frequency to assure a constant outer loop power control do. 도 4 내지 6을 참조하면, 종래의 전력 제어 시스템의 몇 개의 변형예들이 도시되어 있으며, 이들은 UL HS-SICH 및 관련 DCH(dedicated channel)과 같은 공유 채널에 대한 외부 루프 전력 제어 동작을 제공한다. Referring to Figures 4 to 6, and some modification of the conventional power control system are shown, which provides an outer loop power control operation for a shared channel such as UL HS-SICH and the associated DCH (dedicated channel). 이들 변형된 시스템들은 DCH의 보다 규칙적인 관찰을 이용가능하다는 이점을 갖는다. These modified systems have the advantage of being available more regular observation of the DCH. 그 공유 채널에 대해 목표 SIR과 같은 매트릭을 설정하기 위해, 관련 DCH에 대한 목표 SIR은 유도(derivation)의 근거로서 사용된다. To set the matrix, such as a target SIR for the shared channel, the target SIR for the associated DCH is used as a basis for the derivation (derivation). 예를 들어, 특정 WTRU에 대한 HS-SICH에 대한 목표 SIR은 본원 발명에 따라 관련된 DCH에 대해 계산된 목표 SIR로부터 유도된다. For example, the target SIR for the HS-SICH for a particular WTRU are derived from the target SIR computed for the associated DCH in accordance with the present invention. 그 유도는 양호하게는 미리 정해진 수학적 관계에 기초하여 수행되며, 미리 정해진 수학적 관계는 적절한 환경에서는 단순히 등식일 수 있고, 이러한 경우 DCH에 대해 동일한 계산된 SIR이 HS-SICH 전력 제어를 위해 사용된다. The induction is carried out preferably based on the mathematical relationship defined in advance, the predetermined mathematical relationship is used for simple equation may be, in which case the same computed SIR is HS-SICH power control for DCH in the proper environment. 대안으로, 환경에 기초 한 매핑 테이블이 DCH에 적용된 목표 SIR로부터 HS-SICH 상의 목표 SIR을 유도하는데 사용될 수 있다. Alternatively, it can be used to derive a target SIR on HS-SICH is a mapping table based on the environment from the target SIR applied on the DCH. 따라서, DCH 상의 목표 SIR이 특정 WTRU에 대해 변화한 경우, WTRU에 대한 HS-SICH 상의 목표 SIR은 신뢰할 수 있는 동작을 보증하기 위해 업데이트된다. Therefore, when the target SIR on the DCH change for a particular WTRU, the target SIR on the HS-SICH for the WTRU is updated to ensure reliable operation. 3GPP R5 시스템의 HSDPA 동작 동안, WTRU는 CELL_DCH 상태에 있으며, 이 상태에서 WTRU는 RRC 시그널링 제어 및 사용자-플레인(plane) 데이터를 목적으로 상대적으로 낮은 속도의 듀플렉스 DCH를 사용한다. During HSDPA operation in 3GPP R5 system, a WTRU and a CELL_DCH state, in this state, the WTRU RRC signaling control and user-uses a relatively low rate duplex DCH for the purpose of the plane (plane) data. 모든 WTRU는 HS-SICH와 연관된 매우 낮은 속도의 DCH를 가지며, 이 DCH에서 외부 루프 전력 제어는 DCH에서 목표 SIR을 동적으로 조절하기 위해 사용되며, 이 DCH의 계속적인 사용(모든 단일 프레임 또는 모든 두 번째 프레임)은 BLER 및 UL에 대한 측정된 SIR이 의미가 있음을 보증한다. All the WTRU HS-SICH and very low has a rate of DCH, a DCH in the outer loop power control is used to dynamically adjust the target SIR on the DCH, continued use of the DCH (for every single frame or every two associated th frame) should ensure that the measured BLER and the SIR for UL sense. DCH의 UL부 및 HS-SICH가 상이한 UL TS들에 잠재적으로 할당되더라도, 관련 DCH 상의 목표 SIR은 HS-SICH 상의 목표 SIR과 매우 깊게 상호관련되어 있으며, 이것은 그 목표 SIR이 두 개의 채널 모두에 대해 동일한 WTRU 속도 및 WTRU 채널 환경에 주로 의존하기 때문이다. Even if the potential assigned to the DCH in the UL portion and the HS-SICH is different UL TS, the target SIR on the associated DCH is the very closely correlated with a target SIR on HS-SICH, which is the target SIR for both channels because it depends mainly on the same WTRU speed and the WTRU channel environment. 또한, 상이한 TS들에서 상이할 수 있는 UL 인터페이스 레벨들은 이에 대한 보상을 제공하는 다른 전력 제어 파라미터들에 의해 이미 고려된다. Further, UL-level interface that can be different in different TS are already taken into account by other power control parameters that provide compensation for this. 따라서, 본 발명은 특정 WTRU에 대한 UL HS-SICH 상에서 요구되는 목표 SIR을 유도하기 위한 또는 설정하기 위한 신뢰성 있는 외부 루프 전력 제어 기능에 기초하여 정확하게 업데이트되는 UL DCH 상의 목표 SIR을 사용한다. Accordingly, the present invention uses the target SIR on UL DCH that is accurately updated based on the reliability outer loop power control capability to set or to derive a target SIR that is required on the UL HS-SICH for a particular WTRU. 본 발명은 DCH 동작을 감독하는 외부 루프 전력 제어 기능으로부터 정확한 목표 SIR들을 획득하는 것을 가능하게 한다. The present invention makes it possible to obtain accurate target SIR from the outer loop power control function for supervising the DCH operation. HS-SICH에 대한 처리 이득, 패이로드, 및 요구되는 BLER을 DCH의 것들과 비교함으로써, 기본적인 원리들이 2개의 채널들 간에 추천되는 전송 전력 오프셋을 유도하는데 적용된다. By comparing the processing gain, payload and required BLER for the HS-SICH are the ones of the DCH, the transmit power offset is applied to derive the basic principles that like between the two channels. 이렇게 유도된 오프셋은 전송국 또는 수신국 어느 하나에서 실행될 수 있으며, 이것은 HS-SICH에 대한 양호한 3GPP R5 실시예의 경우에 있어서 각각 UE 및 UTRAN에 대응한다. The thus derived offset can be performed in any of the transmitting station or the receiving station, which correspond to the UE and UTRAN in the case of the preferred 3GPP R5 embodiment for a HS-SICH. 도 4 및 5는 본 발명의 가르침에 따른 무선 통신 시스템용 변형된 개루프 전력 제어 시스템을 도시하고 있으며, 도 2에 도시된 종래의 시스템에 대응하는 유사한 구성 요소들은 유사한 참조 번호로서 지시된다. 4 and 5, and illustrates a radio communication system, a modified open-loop power control system according to the teachings of the present invention, like elements which correspond to the conventional system shown in Figure 2 are designated as like references. HS-SICH와 같은 UL 공유 채널의 예에 있어서, 트랜시버(10)는 WTRU이고, 구성 요소(30)는 3GPP R5 UTRAN과 같은 서빙 네트워크를 나타낸다. In the example of the UL shared channel such as the HS-SICH, the transceiver 10 is a WTRU, and the component (30) is the serving network, such as a 3GPP R5 UTRAN. 도 4 및 5의 실시예들의 경우에, 도 2에 도시된 사용자 데이터 경로는 공유 채널과 연관된 DCH의 데이터를 전달한다. In the case of the embodiments of Figures 4 and 5, the User Data path illustrated in Figure 2 delivers the data of the DCH associated with the shared channel. WTRU로부터의 전송용 사용자 데이터를 전송하는 도 3의 데이터 라인(2)은 DCH의 UL 데이터에 대한 라인을 나타내도록 도 4 및 도 5에 데이터 라인(12d)으로서 식별되어있다. Data line of Figure 3 sending the transmission data for the user from the WTRU (2) has been identified as a 4 and the data lines (12d) in FIG. 5 to indicate that the line for the UL data of the DCH. UL DCH 데이터 신호에는 전송 전력 레벨을 조정하기 위해 처리기(15)의 출력(13d)으로부터의 전송 전력 조정을 적용함으로써 조절되는 원하는 전력 레벨이 제공된다. UL DCH data signal is provided with a desired power level which is adjusted by applying a transmit power adjustment from an output (13d) of the processor 15 to adjust the transmission power level. WTRU로의 전송을 위한 사용자 데이터를 전송하는 도 2의 데이터 라인(40)은 DCH의 DL 데이터용 라인을 나타내기 위해 도 4 및 5에 라인(40d)으로서 식별된다. Data line 40 of Figure for transmitting user data for transmission to the WTRU 2 is identified as a line (40d) in Figs. 4 and 5 to indicate the line for DL ​​data of the DCH. 데이터 라인(12s)은 WTRU(10)에서 HS-SICH의 UL 데이터를 전송하기 위해 제공된다. Data line (12s) is provided to transport the UL data of the HS-SICH in the WTRU (10). UL HS-SICH 데이터 신호에는 전송 전력 레벨을 조절하기 위해 처리기(15)의 출력(13s)으로부터의 전송 전력 조정을 적용함으로써 조절되는 원하는 전력 레 벨이 제공된다. UL HS-SICH data signal is provided with a desired power level which is adjusted by applying a transmit power adjustment from an output (13s) of the processor 15 to control the transmission power level. 수신국(30)에서, 수신기(46)는 개별적인 DCH 및 HS-SICH 채널들을 출력하기 위해 제공된다. At the receiving station 30, the receiver 46 is provided to output the separate DCH and HS-SICH channels. 전송기의 처리기(15)에 의해 수행되는 예시적인 WTRU(10)에서의 전력 조정은 양호하게는 채널들 DCH 및 HS-SICH의 각각에 대해 종래의 방식으로 행해진다. Power adjustment in the example WTRU (10) performed by the processor 15 of the transmitter is performed with preferably a conventional manner for each of the channels DCH and HS-SICH. 각각의 전송 전력 조정값을 계산하기 위해, 처리기(15)는 각각의 DCH 및 HS-SICH 목표 SIR 데이터를 전달하는 목표 SIR 데이터 입력(22d,22s), 수신국의 간섭 전력 측정 장치(32)에 의해 발생된 간섭 데이터를 전달하는 간섭 전력 데이터 입력(23), 경로 손실 계산 회로(19)의 출력인 경로 손실 신호를 전달하는 경로 손실 데이터 입력(24)으로부터 각각 데이터를 수신한다. To compute the respective transmit power adjustments, the processor 15 is the target SIR data input (22d, 22s), interference power measuring device 32 of the receiving station to pass the respective DCH and HS-SICH target SIR data It receives the respective data from the output of the path loss data input 24 which passes the path loss of the interference signal the interference power data input 23, a path loss calculation circuit 19 to pass data generated by. 목표 SIR DCH는 양호하게는 측정 장치(34)를 통해 수신된 DCH UL 데이터의 품질을 평가함으로써 종래의 방식으로 발생된다. Target SIR DCH is generated in a conventional manner by evaluating the quality of the received DCH UL data, preferably via a measuring device (34). 디지털 데이터 품질에 대한 전형적인 매트릭(metric)은 비트 에러 레이트 및 블록 에러 레이트이다. Typical metrics (metric) for digital data quality are bit error rate and block error rate. 이들 매트릭의 계산은 시변하는 전파 채널 및 간섭의 기간보다 현저하게 긴 시간의 기간들에 걸쳐 축적된 데이터를 필요로 한다. Calculation of these metrics requires data accumulated over periods of time significantly longer than the period of the time-varying propagation channel and interference. 임의의 주어진 매트릭에 대해, 매트릭과 수신된 SIR 4 간에는 이론적인 관계가 존재한다. For any given metric, there exists a theoretical relationship between the metric and received SIR 4. 매트릭을 평가하는데 충분한 데이터가 원격 수신기에 축적된 경우, 그것은 처리기(36)에서 계산되어 입력(37)에 의해 제공된 원하는 매트릭(원하는 서비스 품질을 나타냄)과 비교된 다음, 업데이트된 목표 SIR DCH이 출력된다. When enough data has been accumulated in the remote receiver to evaluate the metric, it is computed in processor 36, the desired metric provided by the input 37 (representing a desired quality of service) and compare the next, the updated target SIR DCH is output do. 업데이트된 목표 SIR DCH는 원하는 값으로 측정된 매트릭이 수렴하도록 하는, 전송기 내부 루프에 적용되는 (이론상) 값이다. The updated target SIR DCH is the (theoretical) value applied to the transmitter inner loop to cause the measured metric to converge to the desired value. 최종적으로, 업데이트된 목표 SIR DCH는 수신국의 전송기(38) 및 전송국의 수신기(16)를 통해 DCH를 위한 내부 루프에서의 사용을 위해 전송기(11)에 전달된다. Finally, the updated target SIR DCH is passed to the transmitter 11 for use in the inner loop for the DCH by the transmitter 38 and the receiver 16 of the transmitting station of the receiving station. 목표 SIR DCH의 업데이트 레이트는 전력 제어된 전송기에 대한 시그널링 레이트에 관한 품질 통계 및 실제적인 제한들을 축적하는데 필요한 시간에 의해 한정된다. The update rate of target SIR DCH is defined by the time required to accumulate the quality statistic and practical limits on the signaling rate to the power control of the transmitter. 종래의 방식에서는 HS-SICH에 대한 목표 SIR를 계산하기를 시도함에 있어서 HS-SICH를 산발적으로 공유하여 사용하기 때문에 비실용적이다. Impractical because they use to share the HS-SICH in the conventional manner as sporadically in attempting to compute a target SIR for the HS-SICH. 따라서, HS-SICH에 대한 외부 루프 전력 제어는 목표 SIR DCH이 입력되고 목표 SIR HS-SICH가 출력되는 HS-SICH 목표 SIR 유도 장치(27)를 포함한다. Accordingly, the outer loop power control for the HS-SICH includes a HS-SICH target SIR derivation device 27 to be input the target SIR DCH and outputs the target SIR HS-SICH. HS-SICH 목표 SIR 유도 장치(27)는 양호하게는 1:1 또는 임의의 다른 미리 정의된 수학적 관계, 또는 매핑 테이블로부터 채택되는 관계로 DCH 상의 목표 SIR과 HS-SICH 상의 목표 SIR 간의 관계를 설정한다. HS-SICH target SIR derivation device 27 is preferably 1: 1 or setting the relationship between the target SIR and the target on the HS-SICH SIR on DCH in relation to that assumed from the mathematical relationship, or mapping table any other predefined do. 도 4는 HS-SICH 목표 SIR 유도 장치(27)가 수신국(30)에 포함되는 양호한 실시예를 도시한다. Figure 4 illustrates a preferred embodiment of the HS-SICH target SIR derivation device 27 is included in the receiving station 30. 본 발명이 UMTS 시스템에서 구현되는 경우, 전송국(10)은 양호하게는 WTRU를 표현하고, 수신국(30)은 양호하게는 UTRAN의 네트워크 구성 요소들을 나타낸다. Where the invention is implemented in a UMTS system, the transmitting station 10 is particularly represent the WTRU and the receiving station (30) Good Good represents network components of a UTRAN. 목표 SIR HS-SICH는 HS-SICH를 위한 내부 루프에서의 사용을 위해 UTRAN에서 유도되어 UTRAN의 전송기(38) 및 WTRU의 수신기(16)를 거쳐 입력(22s)을 통해 WTRU의 전송기의 처리기(15)에 전달된다. Processor of the target SIR HS-SICH is the WTRU transmitter via an input (22s) is guided in the UTRAN through the transmitter 38 and the receiver 16 in the WTRU of the UTRAN for use in the inner loop for the HS-SICH (15 ) it is passed on. 도 5는 HS-SICH 목표 SIR 유도 장치(27)가 전송국(10)에 포함된 대안의 실시예를 도시하고 있다. Figure 5 shows an alternative embodiment of the HS-SICH target SIR derivation device 27 is included in the transmitting station (10). 이 경우에, 전달된 목표 SIR DCH는 수신국 전송기(38) 및 WTRU의 수신기(16)를 통해 전달되어 WTRU의 전송기(11)의 유도 장치(27)에 공급되며, 이는 다시 HS-SICH 목표 SIR을 유도하여 HS-SICH에 대한 내부 루프에서의 사용을 위해 입력(22s)을 통해 처리기(15)에 공급한다. In this case, the target SIR DCH transmission is transmitted through the receiver 16 of the receiving station transmitter 38 and the WTRU is supplied to the induction device 27 of the transmitter 11 of the WTRU, which in turn HS-SICH target SIR the derived and supplied to the processor 15 via the input (22s) for use in the inner loop for the HS-SICH. 도 6은 본 발명의 가르침에 따른 무선 통신 시스템용 변형된 폐루프 전력 제어 시스템을 도시하며, 여기서 도 3의 종래 시스템에 대응하는 유사한 구성 요소는 유사한 참조 번호로서 지시된다. Figure 6 is similar elements, illustrate a modified radio communication system for closed loop power control system in accordance with the teachings of the present invention, in which corresponding to the conventional system of Figure 3 is indicated as like reference numbers. 예컨대 HS-SICH와 같은 UL 공유 채널에 있어서 트랜시버(50)는 WTRU이며, 구성 요소(70)는 3GPP R5 UTRAN과 같은 서빙 네트워크를 나타낸다. For example, the transceiver 50 in the UL shared channel such as the HS-SICH is a WTRU, component 70 represents the serving network, such as a 3GPP R5 UTRAN. 도 6의 실시예의 경우에, 도 3에 도시된 사용자 데이터 경로는 공유 채널과 연관되어 있는 DCH의 데이터를 전달한다. If the embodiment of Figure 6 in the example, the User Data path illustrated in Figure 3 carries the data of the DCH which is associated with the shared channel. WTRU로부터의 전송용 데이터를 전달하는 도 3의 데이터 라인(52)은 DCH의 UL 데이터용 라인을 나타내기 위해 도 6에서 라인 52d로서 식별된다. Data line 52 of Figure 3 to pass data for transmission from the WTRU is identified as line 52d in Figure 6 to indicate that the line for the UL data of the DCH. UL DCH 데이터 신호에는 전송 전력 레벨을 조절하기 위해 처리기(55)의 출력(53d)으로부터의 전송 전력 조정을 적용함으로써 조절되는 원하는 전력 레벨이 제공된다. UL DCH data signal is provided with a desired power level which is adjusted by applying a transmit power adjustment from an output (53d) of the processor 55 to control the transmission power level. WTRU으로의 전송을 위한 사용자 데이터를 전달하는 도 3의 데이터 라인(80)은 DCH의 DL 데이터에 대한 라인을 나타내기 위해 도 6의 라인 80d으로서 식별된다. Transmitting the user data to pass the data line 80 of Figure 3 as for the WTRU is identified as line 80d in Figure 6 to indicate that the line for the DL data of the DCH. 도 6의 실시예에서, 데이터 라인(52)은 WTRU(10)에서 HS-SICH의 UL 데이터를 전송하기 위해 제공된다. In the embodiment of Figure 6, the data line 52 is provided to transport the UL data of the HS-SICH in the WTRU (10). UL HS-SICH 데이터 신호는 원하는 전력 레벨로 제공되며, 이 원하는 전력 레벨은 전송 전력 레벨을 조정하기 위해 처리기(55)의 출력(53s)으로부터 전송 전력 조정을 적용함으로써 조절된다. UL HS-SICH data signal is provided with a desired power level, a desired power level is adjusted by applying a transmit power adjustment from an output (53s) of the processor 55 to adjust the transmission power level. 수신국(70)에서, 수신기(86)는 개별적인 DCH 및 HS-SICH 채널들을 출력하기 위해 제공된다. In the receiving station 70, the receiver 86 is provided to output the separate DCH and HS-SICH channels. 본 발명이 UMTS 시스템에서 구현되는 경우, 전송국(50)은 양호하게는 WTRU를 나타내고, 수신국(70)은 양호하게는 UTRAN의 네트워크 구성 요소들을 나타낸다. Where the invention is implemented in a UMTS system, the transmitting station 50 is particularly to indicate the WTRU, the receiving station (70) Good Good represents network components of a UTRAN. 전송기의 처리기(55)에 의해 실행되는 예시적인 WTRU(50)의 전력 조정은 채널들 DCH 및 HS-SICH 각각에 대한 종래의 방식으로 행해진다. Power adjustment of an exemplary WTRU (50) to be executed by the processor 55 of the transmitter is made in a conventional manner for the channels DCH and HS-SICH, respectively. 각각의 전송 전력 조정값을 계산하기 위해, 처리기(15)는 입력들(58d, 58s)을 통해 각각의 업/다운 명령 신호들을 수신하고, 이에 기초하여 각각의 전송 전력 조정값을 계산한다. To compute the respective transmit power adjustments, the processor 15 computes the respective transmit power adjustments received each of the up / down command signal, and based thereon via the input (58d, 58s). 폐루프 전력 제어 시스템의 내부 루프에 있어서, 전송국의 전송기(51)는 그 전력을 수신국(70)에 의해 발생된 고속 "스텝-업" 및 "스텝-다운" 명령들에 기초하여 설정한다. In the inner loop of the closed loop power control system, the transmitter 51 of the transmitting station is a high-speed "step-up" caused by the electric power to the receiving station (70) is set on the basis of the command, and "down step". 수신국(70)에서, 수신된 DCH 데이터의 SIR은 측정 장치(72)에 의해 측정되어, 조합기(76d)를 통해 처리기(74)에 의해 발생된 목표 SIR DCH 값과 비교된다. At the receiving station (70), SIR of the received DCH data is measured by the measuring device 72 and compared with a target SIR DCH value generated by the processor 74 via combiner (76d). 측정된 수신 SIR DCH가 목표 SIR DCH 보다 작다면, DCH "스텝-다운" 명령이 처리 회로(77)에 의해 발생되어 수신국의 전송기(78) 및 전송국의 수신기(56)를 거쳐 입력(58d)을 통해 전송기(51)에 전달되고, 그렇지 않은 경우 DCH "스텝-업 명령이 발생된다. 전력 제어 시스템은 시변하는 전파 채널 및 간섭에 실시간으로 영향을 미칠 수 있는 "스텝-업", "스텝-다운" 명령들의 고속 피드백 때문에 "폐루프"로서 간주된다. 요구되는 전송 전력 레벨이 시변 간섭 및 전파에 기인하여 변화하는 경우, 그것은 신속하게 응답하여 전송 전력을 조정한다. If the measured received SIR DCH is less than the target SIR DCH, DCH "step-down" command input via the transmitter 78 and the receiver 56 of the transmitting station in the receiving station caused by the processing circuit (77) (58d) If over is transmitted to the transmitter 51, otherwise DCH "step-up command is generated power control system that can affect the real time to which the time-varying propagation channel and interference" step-up "," step- down are regarded as closed-loop "" because of the fast feedback command ". when the transmit power level required changes due to time varying interference and propagation, it quickly responds and adjusts transmit power. 도 6의 폐루프 전력 제어 시스템의 외부 루프에 대하여, 수신 DCH 데이터의 품질은 측정 장치(73)에 의해 수신국(70)에 의해 평가된다. FIG 6 with respect to the outer loop of the closed loop power control system, the quality of the received DCH data is evaluated in the receiving station 70 by the measuring device (73). 디지털 데이터 품질을 위한 전형적인 매트릭은 비트 에러 레이트 및 BLER이다. Typical metrics for digital data quality are bit error rate and BLER. 이들 매트릭의 계산은 시변 전파 채널 및 간섭의 기간들 보다 현저하게 긴 시간 기간들에 걸쳐 축적된 데이터를 요구한다. Calculation of these metrics requires data accumulated over a significantly longer time period than the period of the time-varying propagation channel and interference. 임의의 주어진 매트릭에 있어서, 매트릭과 수신된 SIR DCH 간에는 이론적인 관계가 존재한다. For any given metric, there exists a theoretical relationship between the metric and received SIR DCH. 매트릭을 평가하기 위해 원격 수신기에서 충분한 데이터가 축적된 경우, 그것은 처리기(74)에 의해 계산되어 원하는 매트릭(원하는 서비스 품질을 나타냄)과 비교되고, 업데이트된 목표 SIR DCH가 출력된다. If there is sufficient data in the remote receiver to evaluate the metric accumulation, it is calculated by the processor 74 and compared with the desired metric (representing a desired quality of service), the updated target SIR DCH is output. 업데이트된 목표 SIR DCH는 전송기(51)의 전력을 제어하는 전송국의 전력 조정 발생 처리기(55)에 전송되는 DCH 스텝 업/다운 명령들의 방향을 결정하기 위해 내부 루프에 사용된다. The updated target SIR DCH is used in the inner loop to determine the direction of the DCH step up / down commands sent to the transmitting station adjusts the power generation processor 55 for controlling the power of the transmitter (51). 종래의 방식에서는 HS-SICH에 대한 목표 SIR 계산을 시도함에 있어서 HS-SICH를 산발적으로 공유하여 사용하기 때문에 비실용적이었다. In the conventional method it was not practical because they use to share the HS-SICH according sporadically as attempting to compute a target SIR for the HS-SICH. 따라서, 도 6은 목표 SIR DCH가 입력되고 목표 SIR HS-SICH가 출력되는 HS-SICH 목표 SIR 유도 장치(87)를 HS-SICH용 외부 루프 전력 제어가 포함하는 양호한 실시예를 도시한다. Thus, Figure 6 illustrates a preferred embodiment for a HS-SICH target SIR derivation device 87 is the target SIR DCH is input and outputs the target SIR HS-SICH includes an outer loop power control for the HS-SICH. HS-SICH 목표 SIR 유도 장치(27)는 양호하게는 1:1 또는 임의의 다른 미리 규정된 수학적 관계, 또는 매핑 테이블로부터 취해지는 관계로서 HS-SICH상의 목표 SIR과 DCH 상의 목표 SIR 간의 관계를 설정한다. HS-SICH target SIR derivation device 27 is preferably 1: 1 or setting the relationship between target SIR on the target SIR and the DCH on HS-SICH a relationship is taken from the mathematical relationship, or mapping table any other pre-defined do. 장치(87)에 의해 발생된 목표 SIR HS-SICH 값들은 조합기(72)를 통해 측정 장치(72)에 의해 측정된 수신 DCH 데이터의 SIR 또는 이것의 도함수와 비교된다. The target SIR HS-SICH value generated by the device 87 are compared to the SIR or its derivative of the received DCH data measured by the measuring device 72 through a combiner 72. The 대안적으로, 수신된 HS-SICH의 SIR이 측정되어 SIR HS-SICH와 비교된다. Alternatively, the SIR of the received HS-SICH is measured and compared to the SIR HS-SICH. 비교된 값이 목표 SIR HS-SICH보다 작다면, HS-SICH "스텝-다운" 명령은 처리 회로(77)에 의해 발생되고 처리되어 수신국의 전송기(78) 및 전송국의 수신기(56)를 거쳐 입력(58s)을 통해 전송기(51)에 전달되고, 그렇지 않으면 HS-SICH "스텝-업" 명령이 발생된다. If the compared value is less than the target SIR HS-SICH, HS-SICH "step-down" command is generated and processed by the processing circuit 77 via the transmitter 78 and the receiver 56 of the transmitting station of the receiving station It is transmitted to the transmitter 51 via an input (58s), otherwise the HS-SICH "step-up" command is generated. 따라서, 상술한 바와 같이, HS-SICH 상의 신뢰할 만한 외부 루프 전력 제어 기능이 UTRA TDD에 대한 HSDPA에서 무선 자원 사용 효율을 위해 달성된다. Thus, it is achieved for, HS-SICH on reliable radio resource usage efficiency in HSDPA for UTRA TDD the outer loop power control function as described above. 따라서, 본 발명은 DCH 상의 목표 SIR 설정과 특정 WTRU에 대한 HS-SICH 간의 새로운 관계 및 그들의 모든 사용을 제공한다. Thus, the present invention provides a new relationship, and all of them use between the HS-SICH for a particular WTRU and the target SIR setting on the DCH. 상술한 설명은 예로서 UTRA TDD의 HSDPA를 참조하여 이루어졌지만 이에 한정되는 것은 아니다. The above description has not been made with reference to HSDPA in UTRA TDD as an example is not limited thereto. 본 발명은 전용 및 공유 채널들을 포함하는 다른 무선 통신 시스템에도 적용가능하다. The present invention is also applicable to other wireless communication systems, including dedicated and shared channels. 본 발명에 따른 다른 변형 및 변화는 당해 기술 분야의 통상적인 지식을 가진 자에 의해 인식될 수 있을 것이다. Other modifications and variations in accordance with the present invention will be appreciated by those of ordinary knowledge in the art. 본 발명은 HS-SICH 동작에 대해 WTRU 특정 목표 SIR의 정확한 업데이트를 허용하는 UTRA TDD에 대한 메카니즘을 제공한다. The present invention provides a mechanism for UTRA TDD that allows accurate updates of WTRU specific target SIR for the HS-SICH operation. 상기 WTRU의 처리기와 동작면에서 관련되어 있으며, 각각의 계산된 UL DCH 및 UL SCH 전력 조정값에 대응하는 각각의 전력 레벨들로 상기 UL DCH 및 관련 UL SCH 상에서 사용자 데이터를 전송하기 위한 전송기를 포함하는 것인, 무선 통신 시스템. A transmitter for transmitting user data on the UL DCH and associated UL SCH as a respective power level that is associated in the processor and the operation side of the WTRU, corresponding to respective computed UL DCH and UL SCH power adjustments the radio communication system as. 제1항에 있어서, 상기 네트워크 유닛은 상기 공유 채널 목표 매트릭 발생기를 포함하는, 무선 통신 시스템. According to claim 1, wherein said network unit is a wireless communication system that includes the shared channel target metric generator. 상기 WTRU들 각각은 상기 WTRU의 처리기가 수신된 DCH 및 SCH 목표 SIR들에 기초하여 전력 조정값을 계산하도록 각각의 DCH 및 SCH 목표 SIR들을 수신하도록 구성된 수신기를 포함하는, 무선 통신 시스템. Each of the WTRU, a radio communication system including a receiver configured to receive respective DCH and SCH target SIR to compute power adjustments based on received DCH and SCH processor is the target SIR of the WTRU. 상기 WTRU들의 각각은 상기 WTRU의 처리기가 수신된 DCH 및 SCH 전력 스텝 명령들에 기초하여 전력 조정값을 계산하도록 각각의 DCH 및 SCH 전력 스텝 명령을 수신하도록 구성된 수신기를 포함하는, 무선 통신 시스템. Each of the WTRU, the wireless communication system including a receiver configured to receive respective DCH and SCH power step commands to compute power adjustments based on DCH and SCH power step commands the handler reception of the WTRU. 제2항에 있어서, 상기 목표 매트릭들은 목표 SIR들이고, 상기 통신 시스템은 UMTS인 것인, 무선 통신 시스템. The method of claim 2, wherein the target metrics are target signal to interference ratios SIR, the communication system like a UMTS the radio communication system. 상기 WTRU들은 각각 상기 WTRU의 처리기가 수신된 DCH 및 HS-SICH 목표 SIR들에 기초하여 전력 조정값을 계산하도록 각각의 DCH 및 HS-SICH 목표 SIR들을 수신하도록 구성된 수신기를 포함하는, 무선 통신 시스템. The WTRU are respectively received DCH and HS-SICH target wireless communication system, comprising a receiver configured to receive respective DCH and HS-SICH target SIR based on the SIR to calculate a power adjustment value processor of the WTRU. 상기 WTRU들은 각각 상기 WTRU의 처리기가 수신된 DCH 및 HS-SICH 전력 스텝 명령들에 기초하여 전력 조정값을 계산하도록 각각의 DCH 및 HS-SICH 전력 스텝 명령들을 수신하도록 구성된 수신기를 포함하는, 무선 통신 시스템. The WTRU can containing the respective DCH and a receiver configured to receive the HS-SICH power step commands to compute the power adjustment value based on each of the DCH and HS-SICH power step commands the handler reception of the WTRU, the radio communication system. 제1항에 있어서, 상기 WTRU들 각각은 공유 채널 목표 매트릭 발생기를 포함하는, 무선 통신 시스템. The method of claim 1, wherein the wireless communication system, to each of the WTRU includes a shared channel target metric generator. 상기 WTRU들 각각은 상기 WTRU의 처리기가 수신된 DCH 목표 SIR들에 기초하여 WTRU의 공유 채널 목표 매트릭 발생기에 의해 발생된 SCH 목표 SIR들을 계산하고 수신된 DCH 목표 SIR들에 기초하여 전력 조정값을 계산하도록 각각의 DCH 목표 SIR들을 수신하도록 구성된 수신기를 포함하는, 무선 통신 시스템. The WTRU of each computes power adjustments based on the SCH target SIR calculated and received DCH target SIR those generated by the shared channel target metric generator of the WTRU based on the processor the received DCH target SIR of the WTRU so that a receiver configured to receive respective DCH target SIR, the radio communication system. 제8항에 있어서, 상기 목표 매트릭들은 목표 SIR들이고, SCH 목표 SIR들이 발생되는 SCH들은 HS-DSCH들과 연관하여 동작하는 HS-SICH들인 것인, 무선 통신 시스템. 9. The method of claim 8 wherein the target metrics are target SIR deulyigo, SCH SCH target SIR that occur are of the radio communication system of HS-SICH which are to operate in conjunction with the HS-DSCH. 상기 WTRU들 각각은 수신된 DCH 목표 SIR들에 기초하여 WTRU의 공유 채널 목표 매트릭 발생기에 의해 발생된 HS-SICH 목표 SIR들을 계산하고 수신된 DCH 목표 SIR들에 기초하여 WTRU의 처리기가 전력 조정값을 계산하도록 각각의 DCH 목표 SIR 들을 수신하도록 구성된 수신기를 포함하는, 무선 통신 시스템. Each of the WTRU is to the processor of the WTRU power adjustments based on the cost based on the received DCH target SIR generated by the shared channel target metric generator of the WTRU calculating a HS-SICH target SIR and the received DCH target SIR wireless communication system, comprising a receiver configured to receive respective DCH target SIR to calculate. 각각의 계산된 UL DCH 목표 매트릭으로부터 유도된 각각의 UL SCH 목표 매트릭을 출력하도록 구성된 공유 채널 목표 매트릭 발생기를 포함하는, 서빙 WTRU. The serving WTRU includes a shared channel target metric generator configured to output a respective UL SCH target metric derived from each computed UL DCH target metric. 제12항에 있어서, 상기 목표 매트릭들은 목표 SIR들인, 서빙 WTRU. The method of claim 12, wherein the target metrics are target SIR, which are, the serving WTRU. 상기 UTRAN은, DCH 및 HS-SICH 목표 SIR들을 전송하고, 이에 의해 상기 다른 WTRU들은 상기 UTRAN 전송기로부터 수신된 DCH 및 HS-SICH 목표 SIR들에 기초하여 전력 조정값을 계산하도록 구성된 전송기를 더 포함하는, 서빙 WTRU. The UTRAN is transmitting DCH and HS-SICH target SIR, and thereby the other WTRU may further include a transmitter configured to compute power adjustments based on the DCH and HS-SICH target SIR received from the UTRAN transmitter , the serving WTRU. DCH 및 HS-SICH 전력 스텝 명령들을 전송하고, 이에 의해 상기 다른 WTRU들이 상기 UTRAN의 전송기로부터 수신된 DCH 및 HS-SICH 전력 스텝 명령들에 기초하여 전력 조정값을 계산하도록 구성된 전송기를 더 포함하는, 서빙 WTRU. Transmitting DCH and HS-SICH power step commands, based on the DCH and HS-SICH power step commands the other WTRU that is received from the UTRAN transmitter thereby further includes a transmitter configured to compute a power adjustment value, serving WTRU. 상기 공유 채널 목표 매트릭 발생기로부터 출력된 UL SCH 목표 매트릭의 함수로서 UL SCH 전력 조정값을 계산하고 수신된 UL DCH 목표 매트릭의 함수로서 UL DCH 전력 조정값을 계산하도록 구성된 목표 매트릭의 함수로서 전력 조정값을 계산하는 처리기를 포함하는, WTRU. The shared channel target metric as a function of UL SCH target metrics output from the generator UL SCH power adjustments calculated values ​​and the received UL DCH as a function of target metrics as a function of target metrics configured to compute UL DCH power adjustments power adjustments , WTRU comprising a processor for calculating. 제16항에 있어서, 상기 목표 매트릭들은 목표 SIR들이고, 상기 처리기는 수신된 DCH 목표 SIR들에 기초하여 WTRU의 공유 채널 목표 매트릭 발생기에 의해 발생된 SCH 목표 SIR들을 계산하고 수신된 DCH 목표 SIR들에 기초하여 전력 조정값을 계산하고, 상기 처리기는 상기 WTRU에 의한 전송을 위해 UL DCH 전송 데이터 신호들와 상기 계산된 UL DCH 전력 조정값을 조합하도록 구성된 조합기와 상기 WTRU에 의한 전송을 위해 상기 UL SCH 전송 데이터 신호들와 상기 계산된 UL SCH 전력 조정값을 조합하도록 구성된 조합기를 구비한 전송기와 동작면에서 관련되어 있는, WTRU. 17. The method of claim 16 wherein the target metrics are target signal to interference ratios SIR, wherein the processor is in the calculated and receives the SCH target SIR generated by the shared channel target metric generator of the WTRU based on received DCH target SIR DCH target SIR on the basis of calculating a power adjustment value, wherein the processor is the UL SCH transmission for transmission by the combiner and the WTRU is configured to combine the UL DCH transmission data signals deulwa the computed UL DCH power adjustments for transmission by the WTRU deulwa data signal, which is associated WTRU from the transmitter and the operation side having a combiner configured to combine the computed UL SCH power adjustments. 제16항에 있어서, 상기 목표 매트릭들은 목표 SIR들이고, 상기 WTRU는 WTRU 전송을 위한 개루프 전송 전력 제어를 구비한 UMTS에서 사용하기 위해 구성되는 것 인, WTRU. 17. The method of claim 16 wherein the target metrics are target SIR deulyigo, the WTRU is, WTRU is configured for use in a UMTS having an open loop transmission power control for WTRU transmissions. 제18항에 있어서, SCH 목표 SIR들이 발생되는 상기 SCH들은 HS-SDCH들과 연관하여 동작하는 HS-SICH들이고, 상기 처리기는 수신된 DCH 목표 SIR들에 기초하여 WTRU의 공유 채널 목표 매트릭 발생기에 의해 발생된 HS-SICH 목표 SIR들을 계산하고 수신된 DCH 목표 SIR들에 기초하여 전력 조정값을 계산하고, 상기 처리기는 상기 WTRU에 의한 전송을 위해 상기 UL DCH 전송 데이터 신호들과 상기 계산된 UL DCH 전력 조정값을 조합하도록 구성된 조합기와 상기 WTRU에 의한 전송을 위해 상기 UL HS-SICH 전송 데이터 신호들와 상기 계산된 UL HS-SICH 전력 조정값을 조합하도록 구성된 조합기를 구비한 전송기와 동작면에서 연관되어 있는, WTRU. 19. The method of claim 18, wherein the SCH is to generate SCH target SIR are by the shared channel target metric generator of the WTRU based on the deulyigo HS-SICH to operate in conjunction with the HS-SDCH, the processor received DCH target SIR the computes power adjustments based on the calculation and receives the generated HS-SICH target SIR DCH target SIR, and wherein the processor is said with the UL DCH transmission data signals for transmission by the WTRU computed UL DCH power for transmission by the configured combiner and the WTRU to combine the adjustment value that is associated in a transmitter and the operation side provided with the UL HS-SICH transmission data signals deulwa combiner configured to combine the computed UL HS-SICH power adjustments , WTRU. 제20항에 있어서, 각각의 계산된 UL DCH 목표 매트릭으로부터 유도된 각각의 UL SCH 목표 매트릭을 발생하는 상기 단계는 상기 네트워크 유닛에 의해 수행되는 것인, 외부 루프 전송 전력 제어 방법. The method of claim 20 wherein the step of generating a respective UL SCH target metric derived from each computed UL DCH target metric is a, the outer loop transmission power control method is performed by the network unit. 상기 WTRU들이 수신된 DCH 및 SCH 목표 SIR들에 기초하여 전력 조정값을 계산하도록 상기 WTRU들의 각각에 의해 각각의 DCH 및 SCH 목표 SIR들을 수신하는 단 계를 더 포함하여 실행되는 것인, 외부 루프 전송 전력 제어 방법. Would the WTRU that received DCH and SCH target based on SIR executed by further comprising the steps of: receiving respective DCH and SCH target SIR by each of the WTRU to calculate the power adjustments, the outer loop transmission power control method. 수신된 DCH 및 SCH 전력 스텝 명령들에 기초하여 상기 WTRU들이 전력 조정값을 계산하도록 상기 WTRU들의 각각에 의해 각각의 DCH 및 SCH 전력 스텝 명령들을 수신하는 단계를 더 포함하여 실행되는 것인, 외부 루프 전송 전력 제어 방법. Is based on received DCH and SCH power step commands the WTRU to be executed by further comprising the step of receiving the respective DCH and SCH power step commands by each of the WTRU to calculate the power adjustments, the outer loop transmission power control method. 제21항에 있어서, 상기 목표 매트릭은 목표 SIR들이고, 상기 방법은 UMTS에서 실행되는 것인, 외부 루프 전송 전력 제어 방법. The method of claim 21, wherein the target metrics are target SIR deulyigo, the method of, the outer loop transmission power control method to be executed in the UMTS. 수신된 DCH 및 HS-SICH 목표 SIR들에 기초하여 상기 WTRU들이 전력 조정값을 계산하도록 상기 WTRU들의 각각에 의해 각각의 DCH 및 HS-SICH 목표 SIR들을 수신하는 단계를 더 포함하는 외부 루프 전송 전력 제어 방법. Based on received DCH and HS-SICH target SIR the WTRU to the outer loop transmission power control further comprising receiving the respective DCH and HS-SICH target SIR by each of the WTRU to compute power adjustments Way. 수신된 DCH 및 HS-SICH 전력 스텝 명령들에 기초하여 상기 WTRU들이 전력 조정값을 계산하도록 상기 WTRU들의 각각에 의해 각각의 DCH 및 HS-SICH 전력 스텝 명령들을 수신하는 단계를 더 포함하는, 외부 루프 전송 전력 제어 방법. Based on received DCH and HS-SICH power step commands further comprising the step of receiving the respective DCH and HS-SICH power step commands by each of the WTRU wherein the WTRU were to calculate the power adjustments, the outer loop transmission power control method. 각각의 계산된 UL DCH 목표 매트릭으로부터 유도된 각각의 UL SCH 목표 매트릭을 발생하는 상기 단계는 상기 WTRU들에 의해 수행되는 것인, 외부 루프 전송 전력 제어 방법. The method comprising: generating a respective UL SCH target metric derived from each computed UL DCH target metric is a, the outer loop transmission power control method is performed by the WTRU. 상기 WTRU들이 수신된 DCH 목표 SIR들에 기초하여 상기 WTRU들에 의해 발생된 SCH 목표 SIR들을 계산하고 수신된 DCH 목표 SIR들에 기초하여 전력 조정값을 계산하도록 각각의 DCH 목표 SIR들을 상기 WTRU들의 각각에 의해 수신하는 단계를 포함하여 실현되는 것인, 외부 루프 전송 전력 제어 방법. Respective DCH target SIR based upon the WTRU are received DCH target SIR calculating the SCH target SIR generated by the WTRU based on received DCH target SIR to compute power adjustments each of the WTRU is, the outer loop transmission power control method will be realized, including the step of receiving by the. 제27항에 있어서, 상기 목표 매트릭들은 목표 SIR들이고, 상기 방법은 UMTS에서 실행되는 것인, 외부 루프 전송 전력 제어 방법. The method of claim 27, wherein the target metrics are target signal to interference ratios SIR, the method of, the outer loop transmission power control method to be executed in the UMTS. 수신된 DCH 목표 SIR들에 기초하여 상기 WTRU들에 의해 발생된 HS-SICH 목표 SIR들을 계산하고 수신된 DCH 목표 SIR들에 기초하여 상기 WTRU들이 전력 조정값을 계산하도록 상기 WTRU들의 각각에 의해 각각의 DCH 목표 SIR들을 수신하는 단계를 더 포함하는 외부 루프 전송 전력 제어 방법. A based on the received DCH target SIR generated by the WTRU HS-SICH target SIR calculated based on received DCH target SIR each by each of the WTRU to the WTRU that computes power adjustments of the outer loop transmission power control method further comprises the step of receiving a target SIR DCH. 각각의 계산된 UL DCH 목표 매트릭으로부터 유도된 각각의 UL SCH 목표 매트릭들을 발생하는 단계를 포함하는, 전송 전력 제어 실행 방법. Comprising the step of generating a respective UL SCH target metric derived from each computed UL DCH target metric, a transmission power control method executed. 제31항에 있어서, 상기 목표 매트릭의 계산 및 발생 단계는 목표 SIR들의 계산 및 발생 단계를 포함하는, 전송 전력 제어 실행 방법. The method of claim 31, wherein the calculation step and generation of the target metric is, transmission power control is executed comprises a calculation step and generation of the target SIR. 상기 방법은 DCH 및 HS-SICH 목표 SIR들을 전송하고 이에 의해 상기 다른 WTRU들은 상기 UTRAN으로부터 수신된 DCH 및 HS-SICH 목표 SIR들에 기초하여 전력 조정값을 계산하는 단계를 더 포함하는 전송 전력 제어 실행 방법. The method DCH and HS-SICH transmits the target SIR, and this other WTRU above by their transmission power control executed further includes a step of calculating a power adjustment value based on the DCH and HS-SICH target SIR received from the UTRAN Way. DCH 및 HS-SICH 전력 스텝 명령들을 전송하여 상기 다른 WTRU들이 상기 UTRAN으로부터 수신된 DCH 및 HS-SICH 전력 스텝 명령들에 기초하여 전력 조정값을 계산하는 단계를 더 포함하는 전송 전력 제어 실행 방법. DCH and HS-SICH transmission power control method executed by the power step commands that are sent to the other WTRU further comprising calculating a power adjustment value based on the DCH and HS-SICH power step commands received from the UTRAN. 상기 수신된 UL DCH 목표 매트릭의 함수로서 UL DCH 전력 조정값을 계산하고 UL SCH 목표 매트릭의 함수로서 UL SCH 전력 조정값을 계산하는 단계를 포함하는, 전송 전력 제어 실행 방법. , The transmit power control implemented method of calculating the UL DCH power adjustments as a function of the received UL DCH target metric includes the step of calculating the UL SCH power adjustments as a function of UL SCH target metrics. 제35항에 있어서, 상기 목표 매트릭들은 목표 SIR들이고, 상기 WTRU는 수신된 DCH 목표 SIR들에 기초하여 상기 WTRU에 의해 발생된 SCH 목표 SIR들을 계산하고 수신된 DCH 목표 SIR들에 기초하여 전력 조정값을 계산하고, 상기 WTRU는 상기 계산된 UL DCH 전력 조정값과 상기 WTRU에 의한 전송을 위해 UL DCH 전송 데이터 신호들을 조합하고, 상기 계산된 UL SCH 전력 조정값과 상기 WTRU에 의한 전송을 위해 UL SCH 전송 데이터 신호들을 조합하는, 전송 전력 제어 실행 방법. 36. The method of claim 35, wherein the target metrics are target signal to interference ratios SIR, wherein the WTRU is a power adjustment value based on the calculation of the SCH target SIR generated by the WTRU based on received DCH target SIR and the received DCH target SIR the calculation, and the WTRU is the computed UL DCH power adjustments and for transmission by the WTRU and combines the UL DCH transmission data signals for transmission by the computed UL SCH power adjustments with the WTRU UL SCH , the transmission power control method executed to combine the transmission data signal. 제35항에 있어서, 상기 목표 매트릭들의 계산 및 발생 단계는 SIR들을 계산 및 발생하는 단계를 포함하고, 상기 WTRU는 WTRU 전송을 위한 개루프 전송 전력 제어를 실행하는 UMTS에서 사용하기 위해 구성되는, 전송 전력 제어 실행 방법. 36. The method of claim 35, wherein the calculation and the generation step of the target metrics comprises the step of calculating and generating a SIR, the WTRU is transmitting is configured for use in a UMTS running open loop transmission power control for WTRU transmission power control practices. 제37항에 있어서, SCH 목표 SIR들이 발생되는 상기 SIR들은 HS-DSCH들과 연관하여 동작하는 HS-SICH들이고, 상기 WTRU는 수신된 DCH 목표 SIR들에 기초하여 상기 WTRU에 의해 발생된 HS-SICH 목표 SIR들을 계산하고 수신된 DCH 목표 SIR들에 기초하여 전력 조정값을 계산하고, 그 계산된 UL DCH 전력 조정값을 상기 WTRU에 의한 전송을 위해 상기 UL DCH 전송 데이터 신호들과 조합시키고, 상기 계산된 UL HS-SICH 전력 조정값을 상기 WTRU에 의한 전송을 위해 UL HS-SICH 전송 데이터 신호들과 조합시키는, 전송 전력 제어 실행 방법. The method of claim 37 wherein the SIR that occur SCH target SIR are deulyigo HS-SICH to operate in conjunction with the HS-DSCH, the WTRU is a based on the received DCH target SIR generated by the WTRU HS-SICH calculating the target SIR, and computes power adjustments based on received DCH target SIR, and for transmission by the computed UL DCH power adjustments to the WTRU were combined with the UL DCH transmission data signals, and the calculated the UL HS-SICH power adjustments to the transmit power control method for execution in combination with HS-SICH transmission data signals for UL transmission by the WTRU.